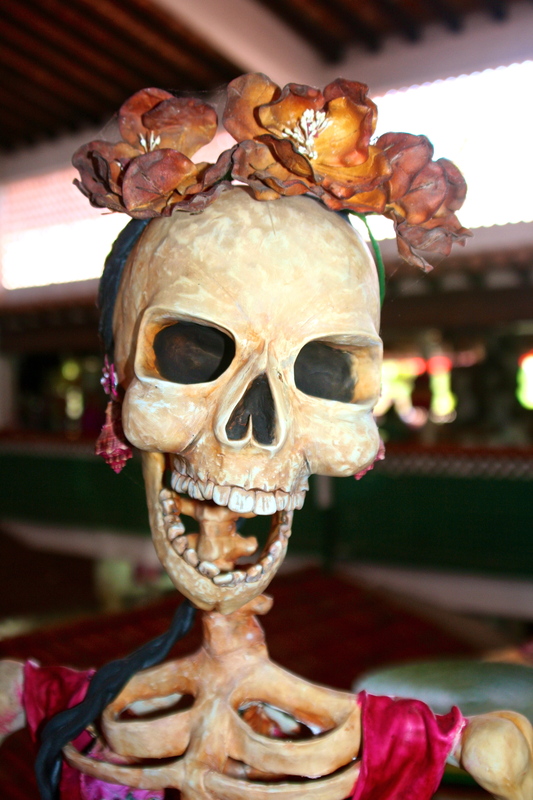 Peggy and I found this beauty at the public market in Puerto Vallarta, Mexico. 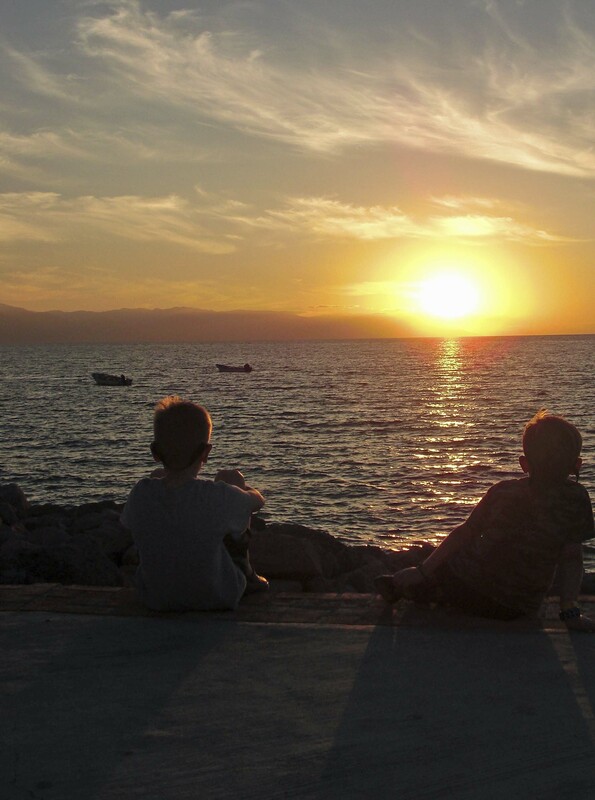 The purpose of the day is to remember friends and family who have passed on. It’s big in Mexico. And Mexicans have made a fortune in selling representative statues to tourists. 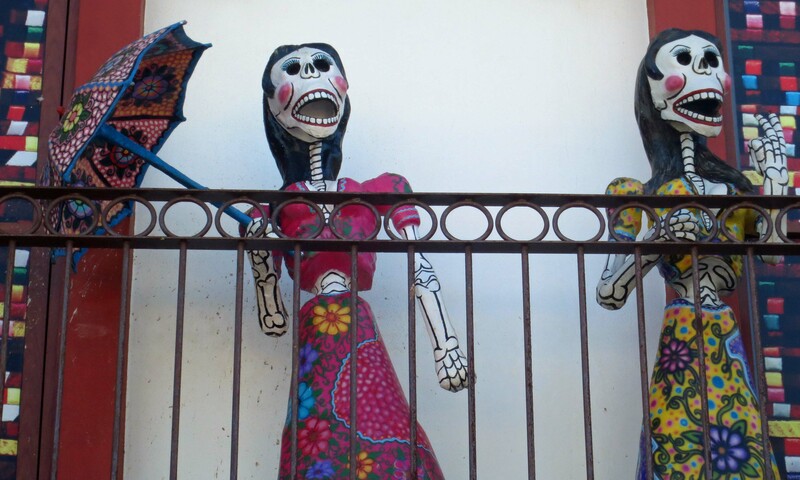 Today, Día de Muertos is a Catholic festival, but it owes its beginning to the Aztecs. People often take the favorite foods of the deceased out to the gravesite so the dead person can feast. Got to keep those ghosts happy. Trick or treat comes to mind. 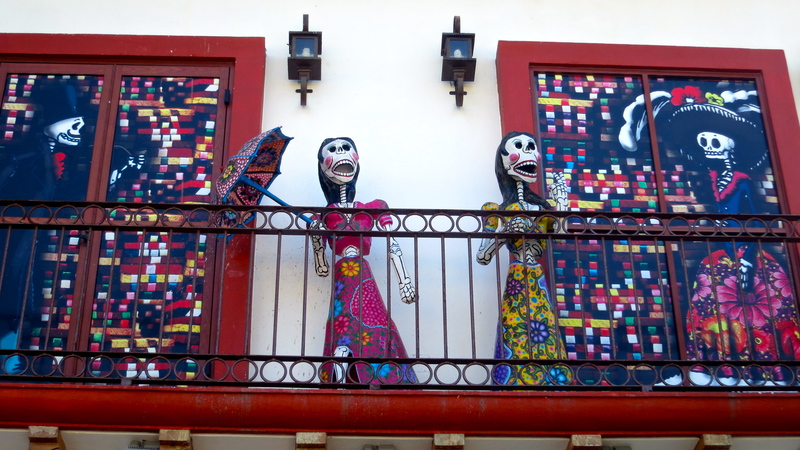 A popular restaurant in Puerto Vallarta features these two singing cuties on its balcony. A side view of my favorite. Check out the earrings! The ocean is both beautiful and mysterious, filled with marvelous creatures of the deep. 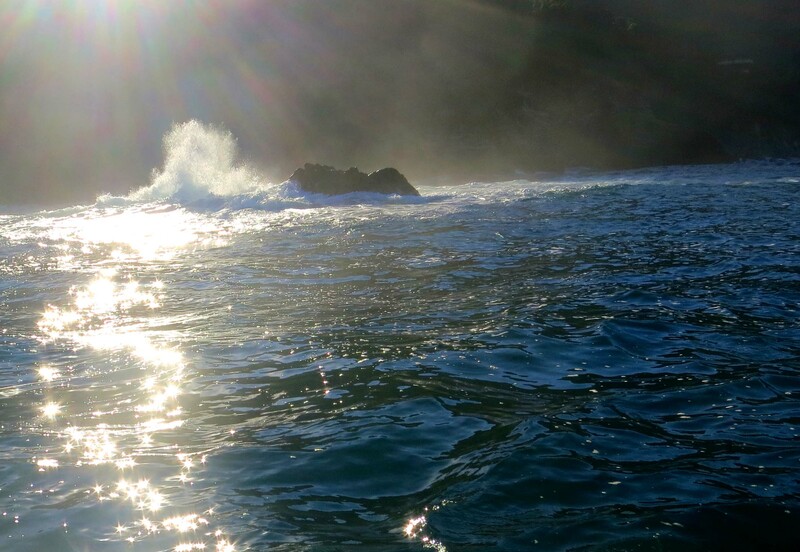 I took this photo outside of Banderas Bay, Mexico. 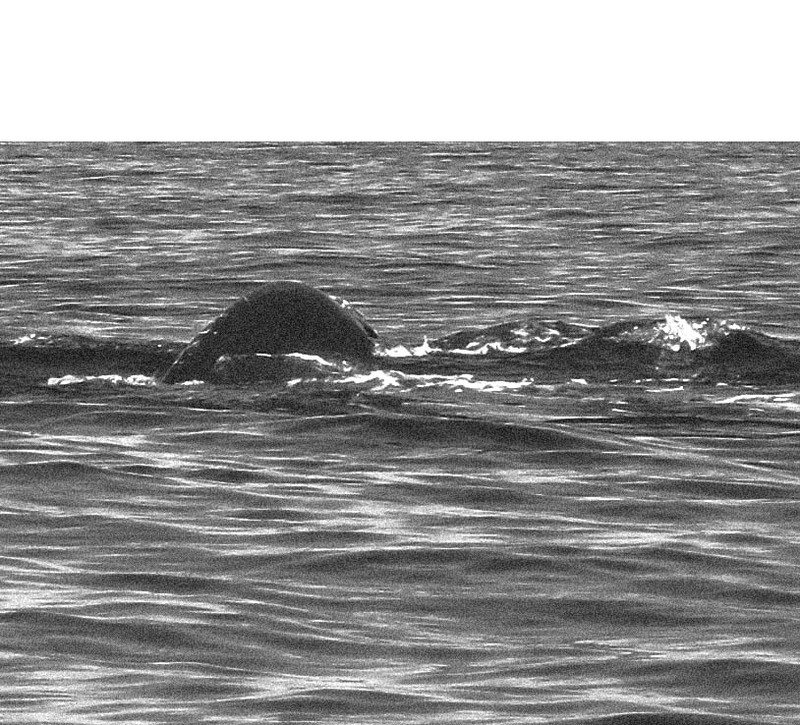 You have all seen the grainy photos of Nessie, the want-to-be monster that hangs out at Loch Ness in Scotland. I, too, have stood on the shores of the fabled lake with eyes peeled and camera poised. Unfortunately, Nessie didn’t bless me with her presence. Sigh. Neither fame nor fortune was to be mine. 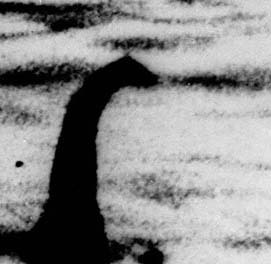 One of the more famous photos of Nessie, the Loch Ness Monster. This is an AP photo. Nessita, Nessie’s daughter looks across the Bay of Banderas in search of a tourist who has eaten too many tacos. Having spotted her prey, Nessita dives beneath the water, coils unfurling as she goes. I am basically an honest guy, however. Otherwise I’d be rich or in jail. Right? Plus, all of you good folks who follow me, not to mention Word Press, might get a little excitable if I deliberately misled you. I am already under suspicion for reporting on ghosts and Bigfoot. So, I have to confess. 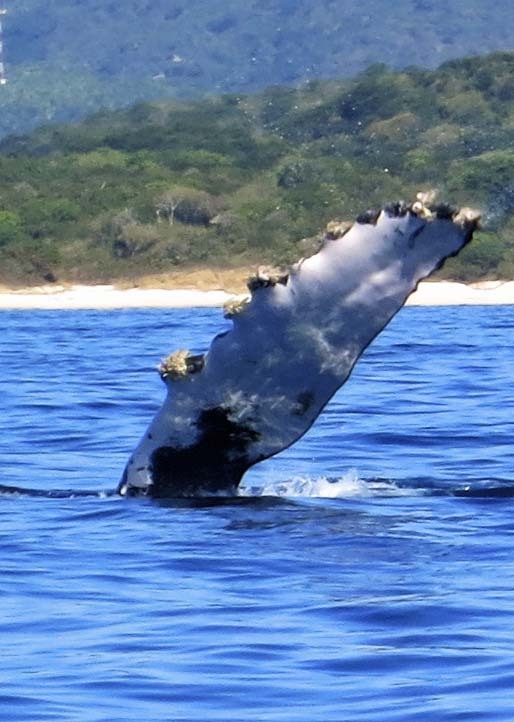 What my son-in-law Clay, grandson Ethan, and I came across while fishing were humpback whales frolicking in Banderas Bay. But even they were wonderful, and strange. 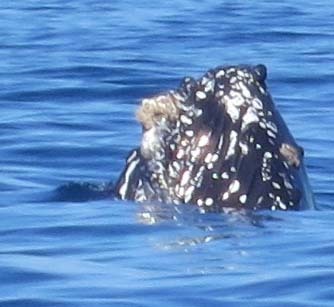 Dorsal fin of humpback whale in the Bay of Banderas. How was the fishing? At least fair to middling, as the old timers say. Consider it from Ethan’s perspective. Any time you can catch a fish almost as big as you are, it’s a BIG fish. Imagine the tales that Ethan had to tell when he returned to school in Tennessee. 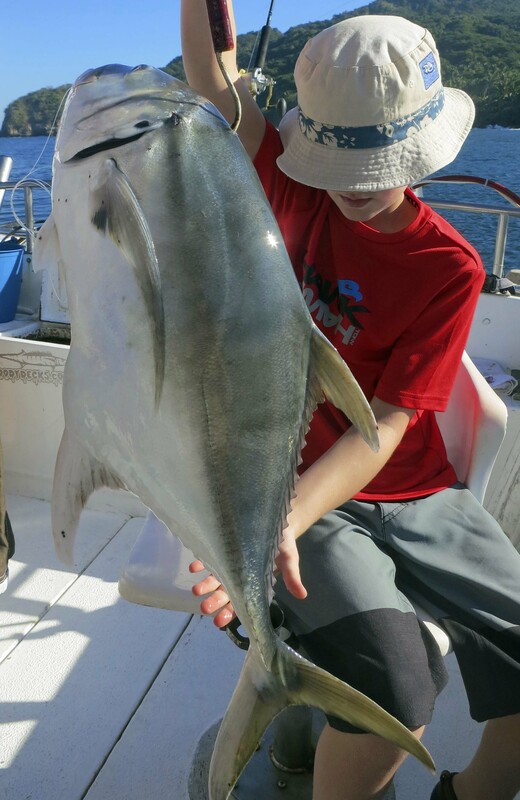 Our grandson Ethan displays his catch, a jack crevalle. Even Clay and I got lucky. 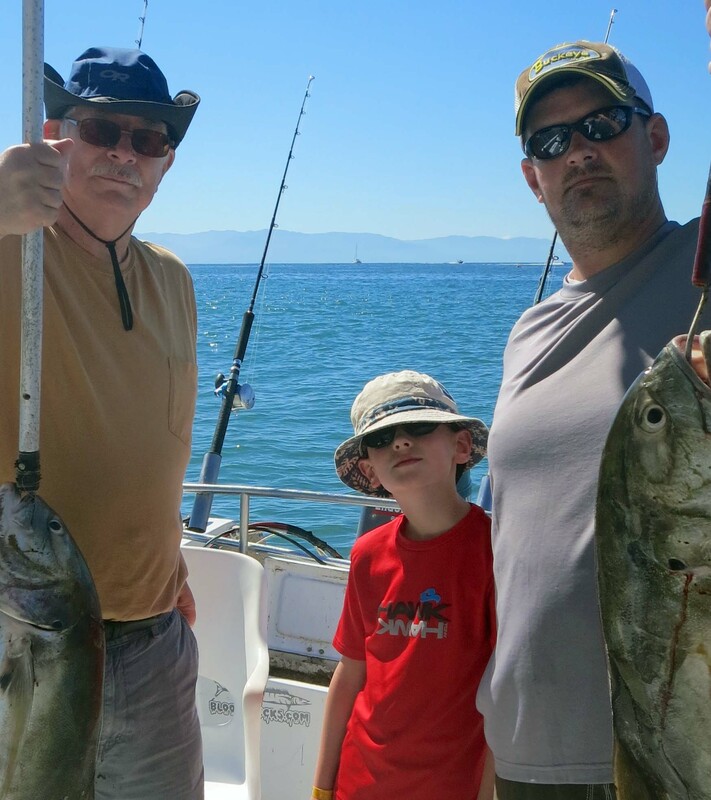 Nice fish, but would you invite this motley crew into your house? NEXT BLOG: 2014 Burning Man tickets go on sale in February. I give you five reasons you might want to purchase one. 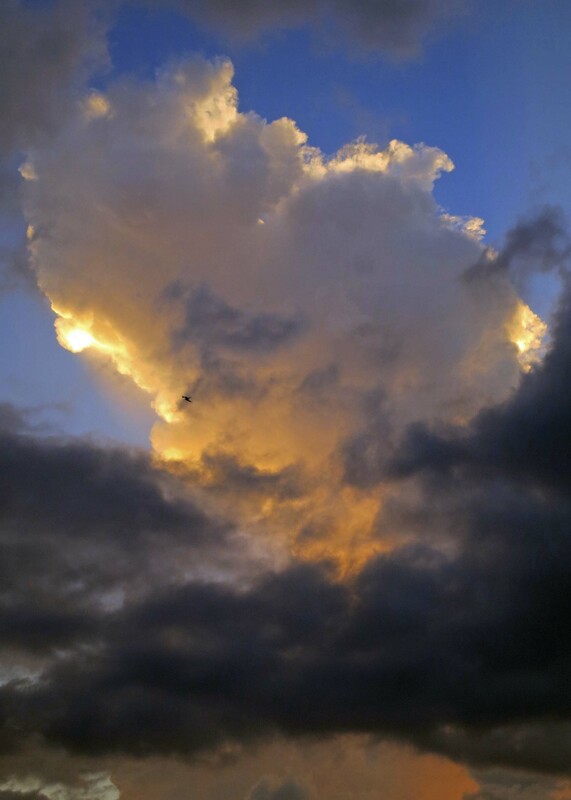 My father, who was a talented landscape photographer and painter, always discussed sunsets with a certain disdain. “Post card art,” he would sniff. When I sorted through his thousands of slides after he passed away, however, what did I find: dozens if not hundreds of sunset photos. 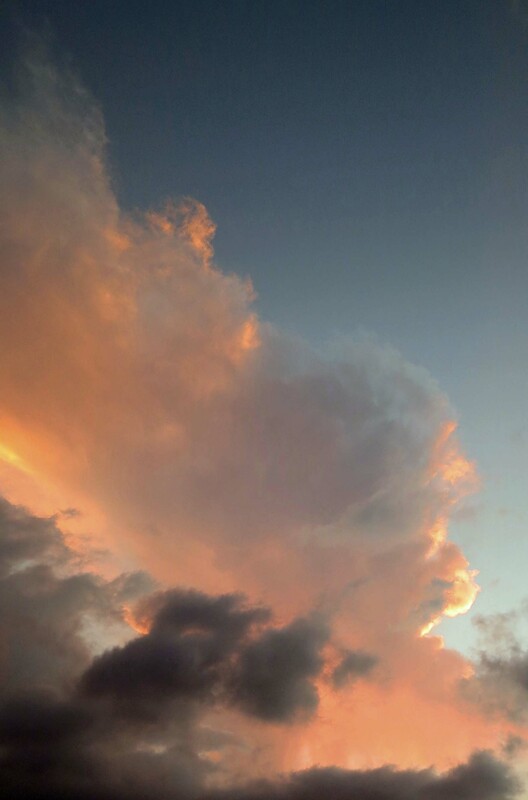 Apparently, the old fellow had been as addicted to sunsets as I am. 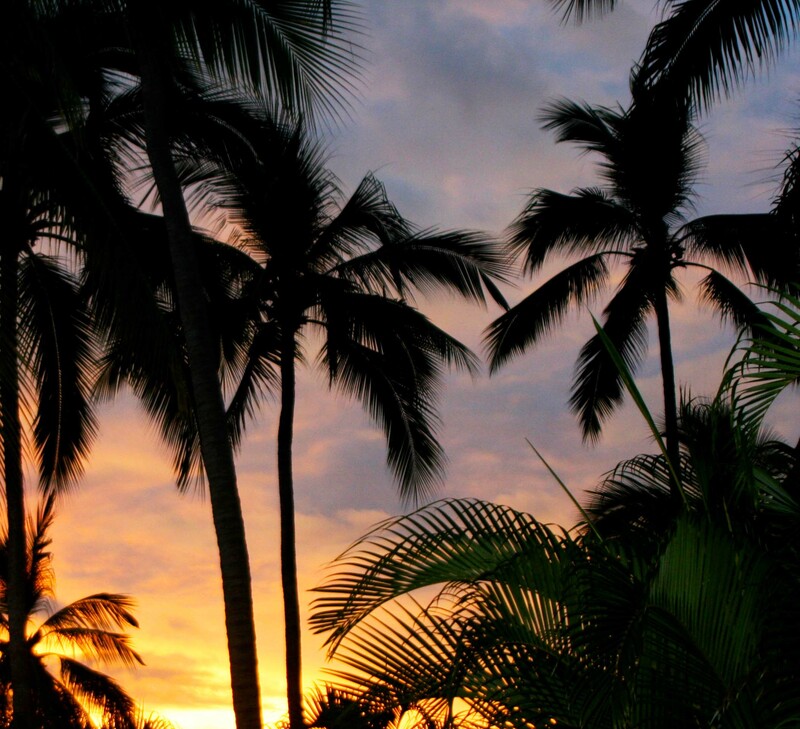 Scenic sunsets beg to be photographed… even more so when warm tropical breezes and palm trees are involved. 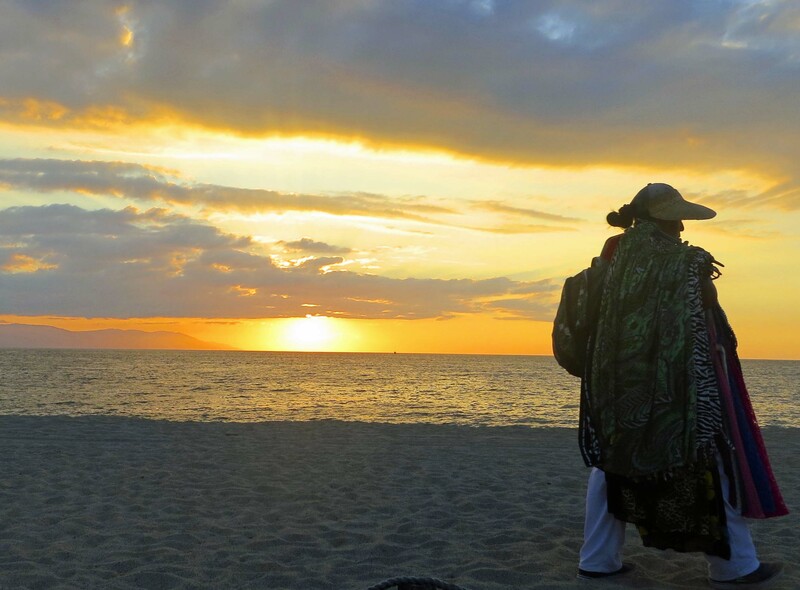 Peggy and I found ourselves out on the beach every evening in Puerto Vallarta waiting for the show to start, and we were never disappointed. I’ll let the photos tell the story. 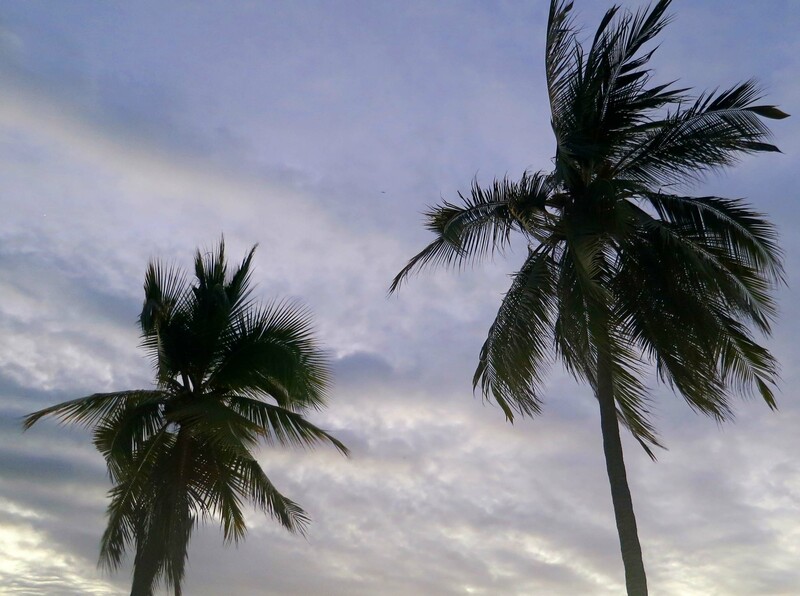 I caught these two palms outlined against the sky with just a hint of color in the clouds. After a long day of work, a beach vendor heads home just as the sun drops behind the horizon. Another shot from the same perspective looking down Puerto Vallarta’s beach front across Banderas Bay. I took this photo with my camera inches above the sand. Think of it as a crab’s perspective on the sunset. 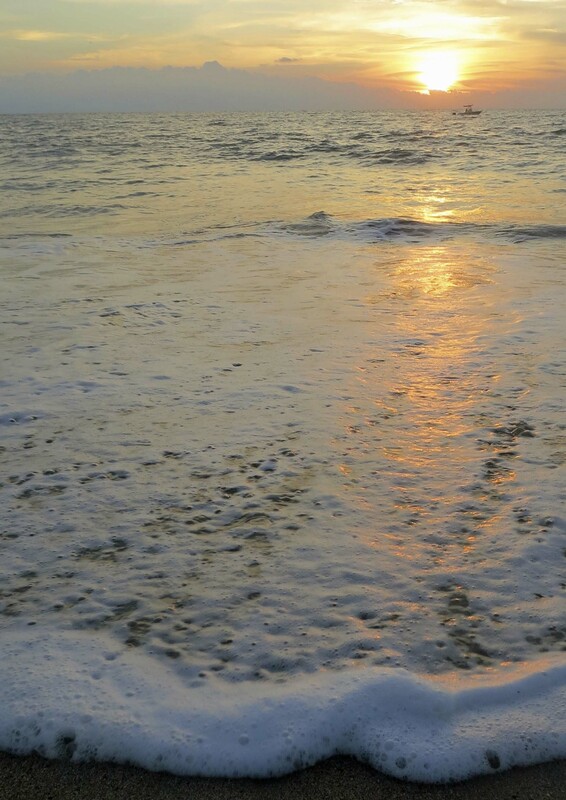 Sea foam adds its own twist to sunset photos on the beach. Just for fun, I’ll conclude this post with a non-sunset photo. I gave you the sea from the perspective of a crab. 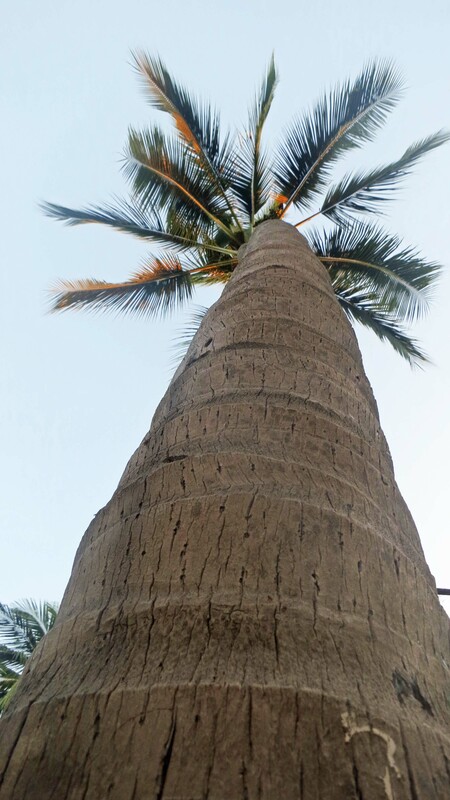 This is a palm tree from the perspective of an iguana. 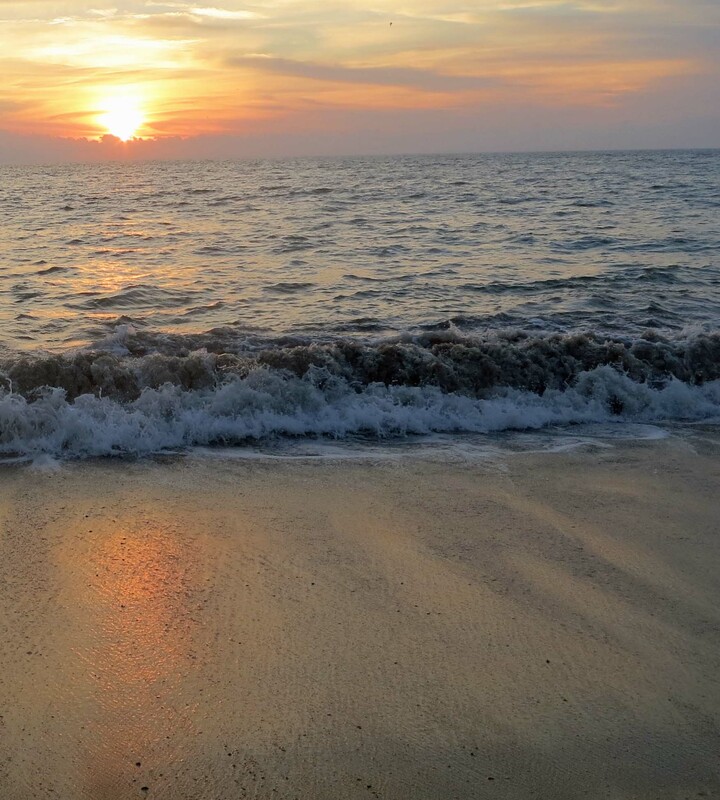 NEXT BLOG: I will wrap up my Puerto Vallarta series with a few photos I couldn’t fit into my posts including a whale and one small boy catching a very big fish. 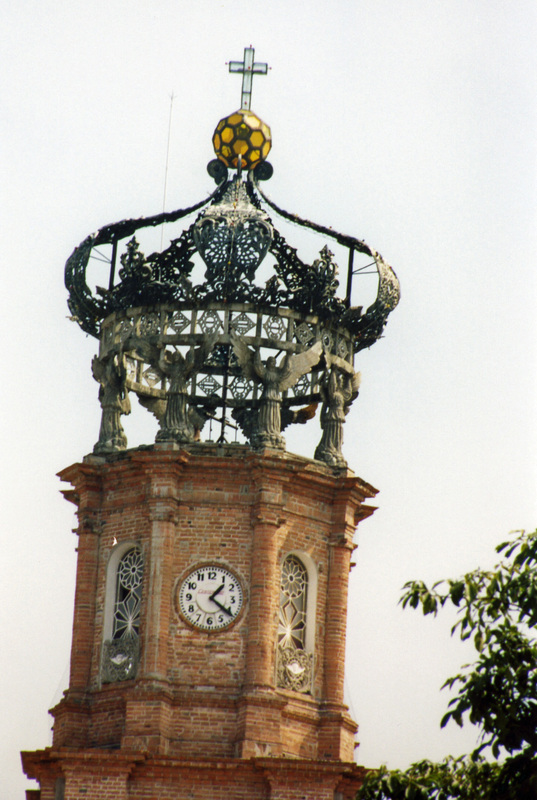 The crown of Puerto Vallarta’s iconic Church of Our Lady of Guadalupe. Juan Diego had a vision on December 9, 1531 according to the Catholic Church: the Virgin Mary, i.e. Our Lady of Guadalupe, met him on a hilltop near Mexico City and asked that a church be built on the site to honor her. To prove her identity, she cured Juan’s uncle of an incurable disease and had him take flowers bundled in his cloak to the local bishop. When Juan opened the cloak for the bishop, an image of the Virgin was embedded in it. 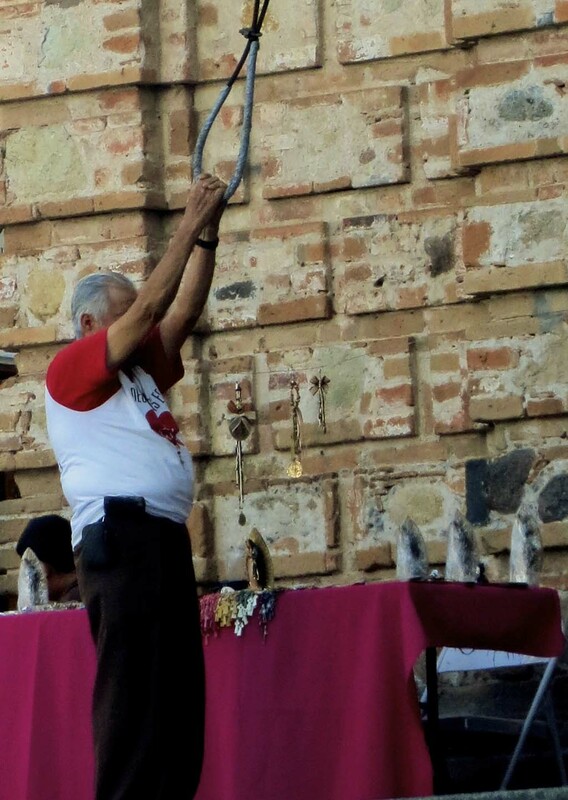 The Virgin got her church and Our Lady of Guadalupe has been big in Mexico ever since. Pope John Paul II declared her the Empress of Latin America in 1999. Juan Diego was canonized in 2002. He’s now a saint. As for the cloak, it is enshrined in the Basilica of Our Lady of Guadalupe in Mexico City. It is the most visited shrine to the Virgin Mary in the world. Millions of people stop by to pray and ask for blessings. 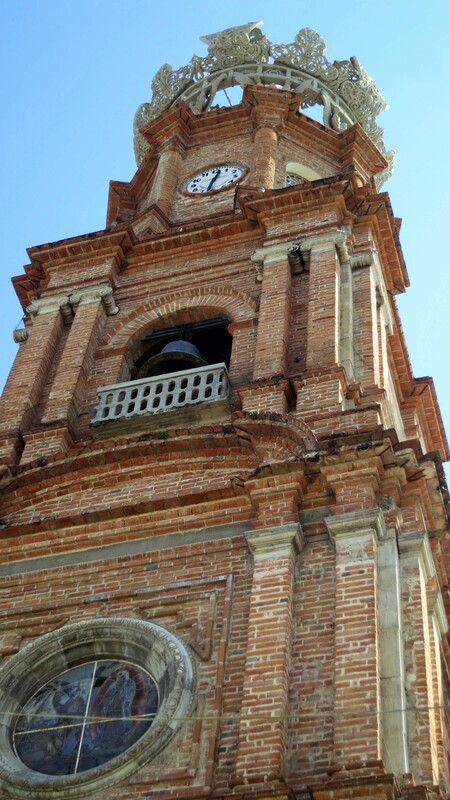 Thus it isn’t surprising that the people of Puerto Vallarta decided to name their church after the Lady when they built it in the early 1900s. 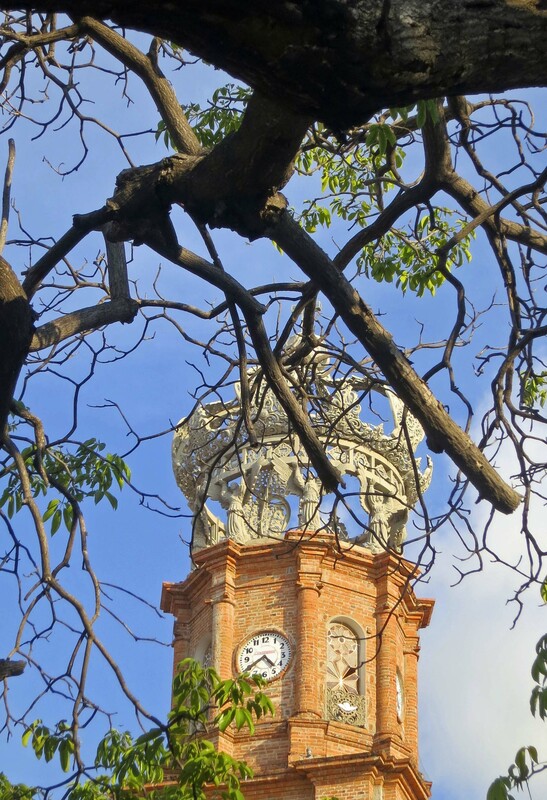 The beautiful structure has become an icon for the city of Puerto Vallarta. 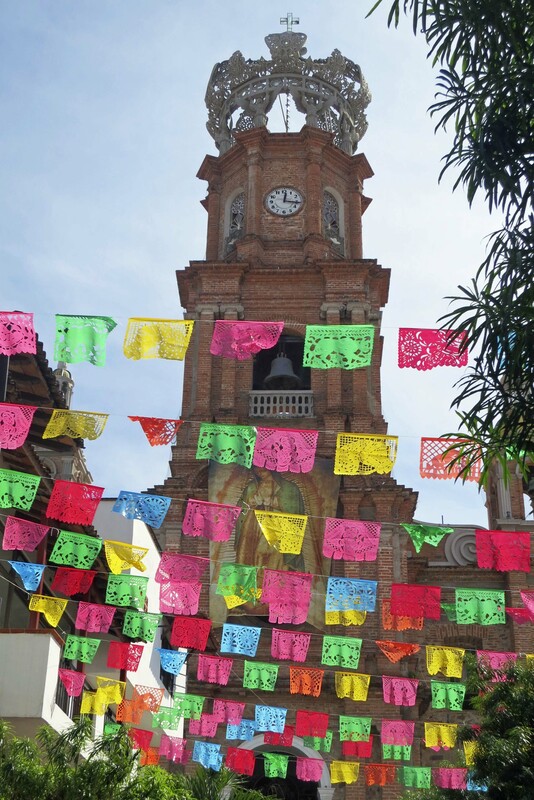 We were there in early December for Our Lady of Guadalupe’s Feast Day. The church was packed with events and people. 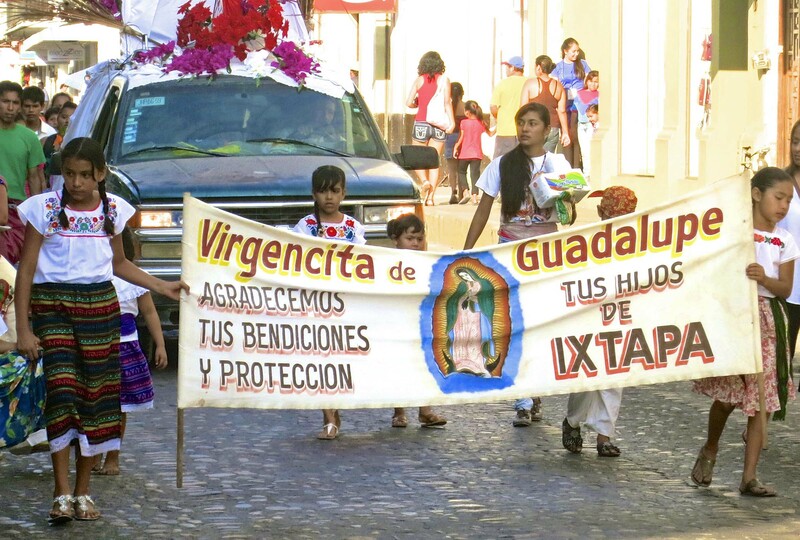 A number of activities were planned around the feast day of Our Lady of Guadalupe including this parade. The painting in the middle depicts the image on Juan Diego’s cloak. This shy young lady was part of the parade. She seemed to take her role quite seriously. But is that the beginning of a smile? 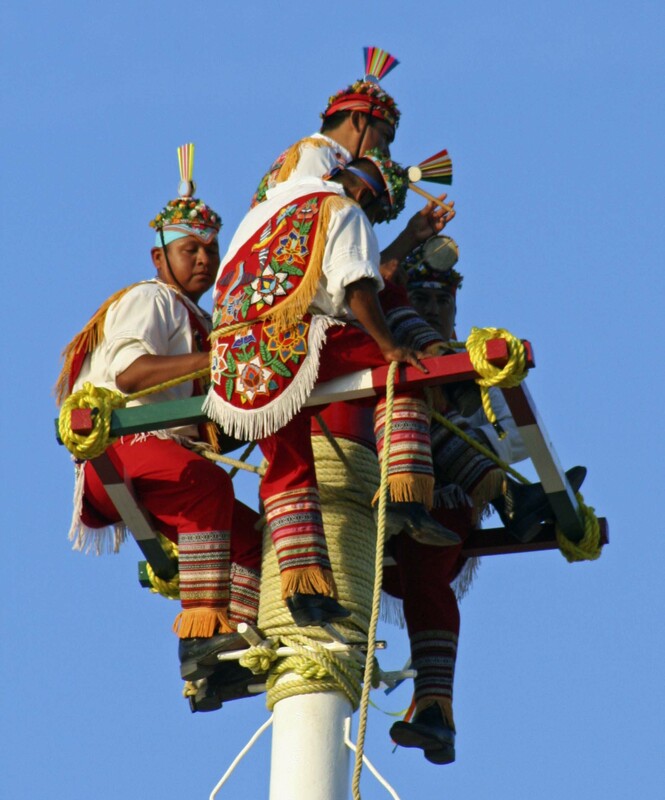 The church bell-ringer did his job, calling the faithful to church. The number of events made it difficult to get inside and photograph the church. The first time I stopped by, a hearse was parked outside. I thought, um no, not a good time. This photo was of a Quinceanera, I believe, a 15-year-old girl’s coming out celebration. Following are several more photos of the church. 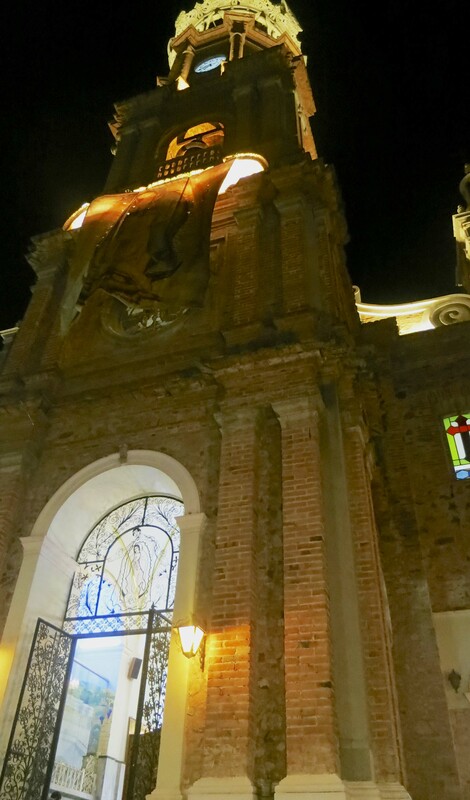 Looking up at the Church of Our Lady Of Guadalupe. 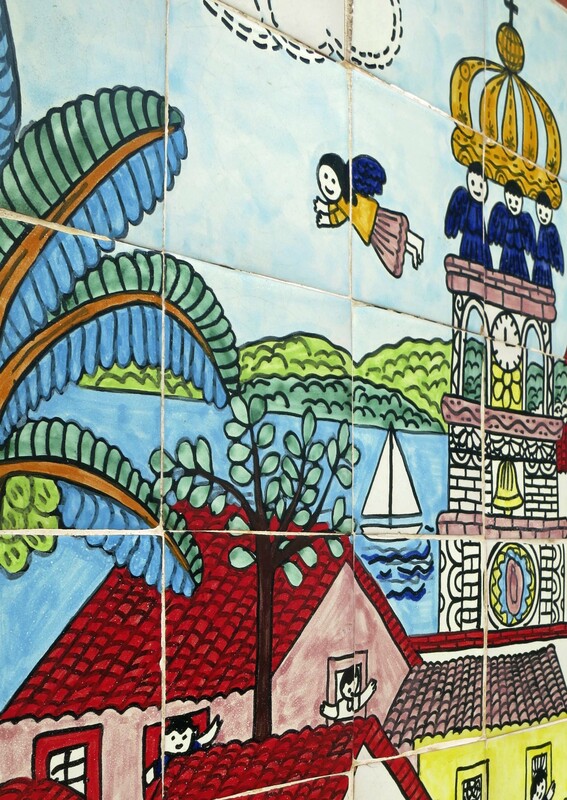 One of many depictions we found of the church in Puerto Vallarta murals. Looking up at the church through street decorations. A final view of the church through the trees. 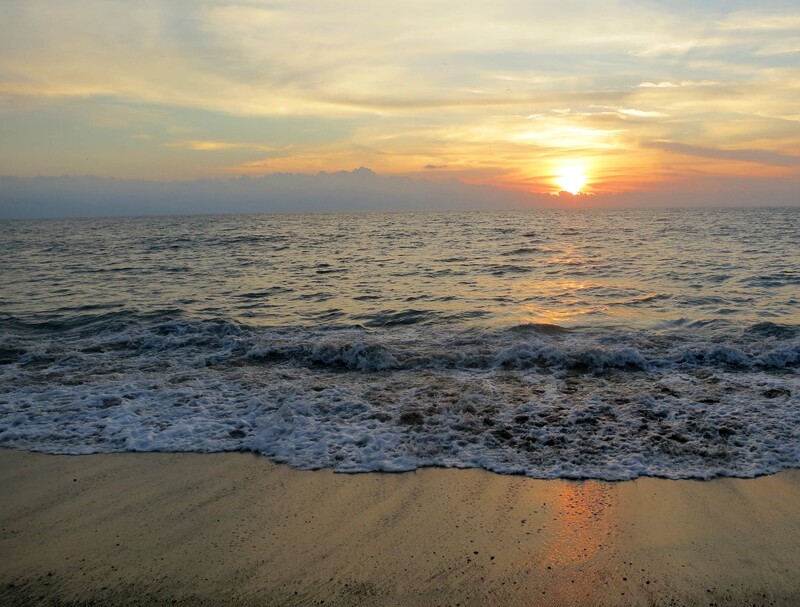 NEXT BLOG: The tropical sunsets of Banderas Bay and Puerto Vallarta. I am also one hundred percent convinced that a walkabout is the best way to see a city. Nothing– not cars, taxis, trains, busses or even bicycles, can match walking. Everything else is too fast. “Wow,” you think, “that’s great…” and it’s gone. But if you are walking you can stop and savor, you can admire, touch, smell, and even listen to a city. 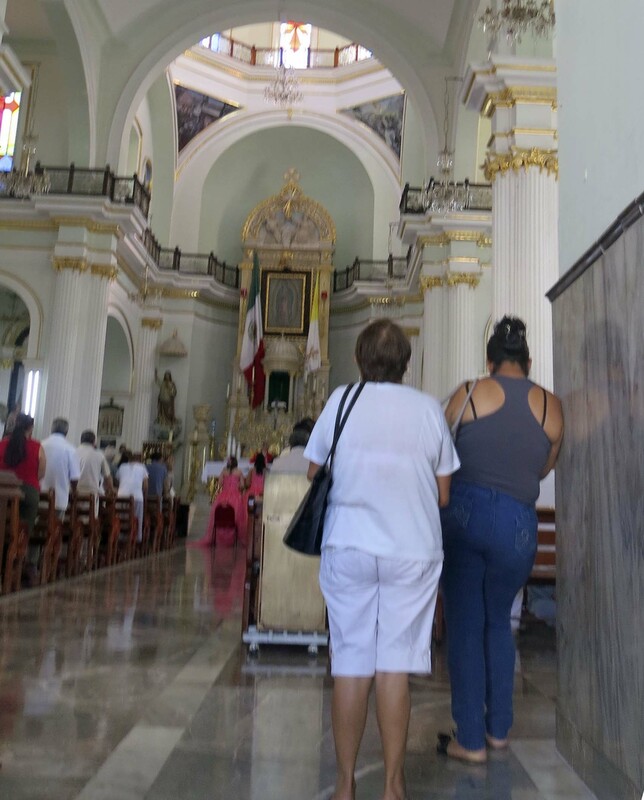 So Peggy and I walk… whether we are wandering the streets of Rome, New York City, or Puerto Vallarta. 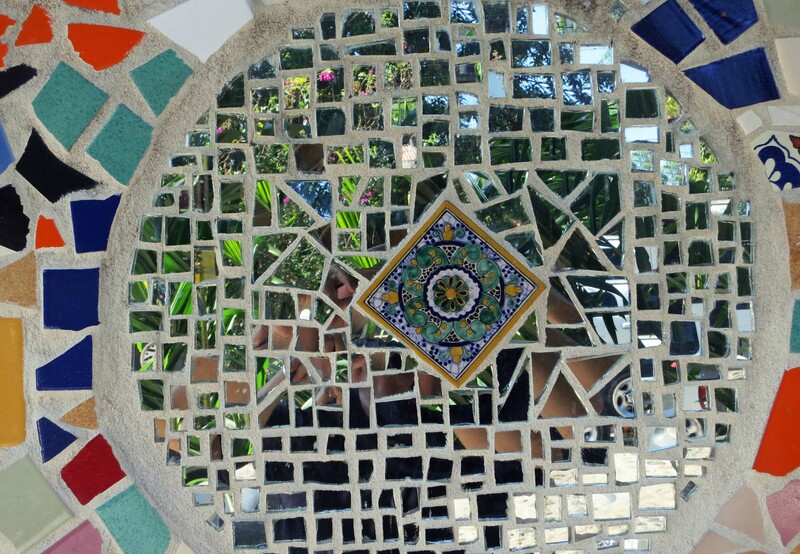 Following are some of the sights we saw along the way on our recent visit to PV. 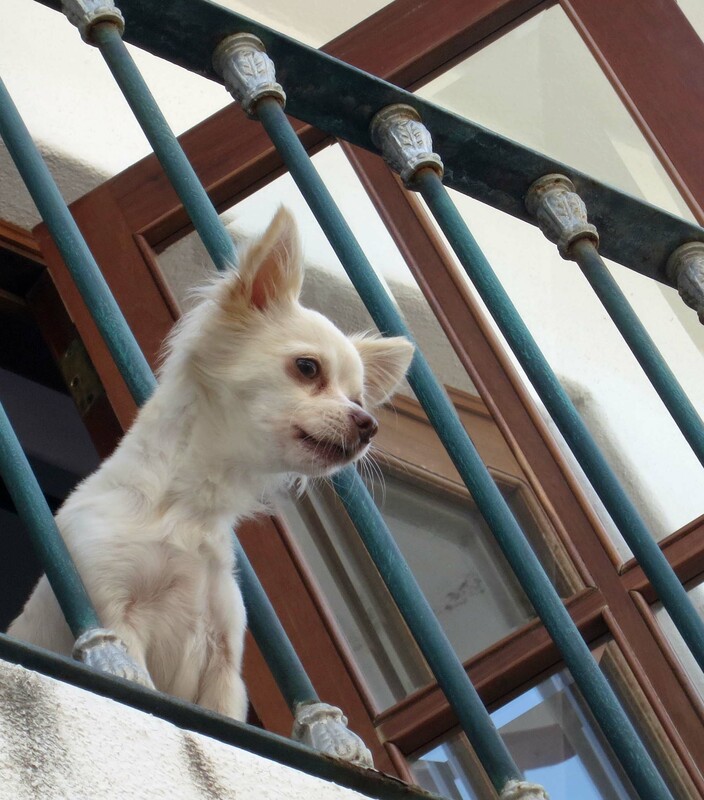 This resident dog checked us out. Apparently we didn’t pass muster. He immediately started barking. I could still hear him two blocks away. 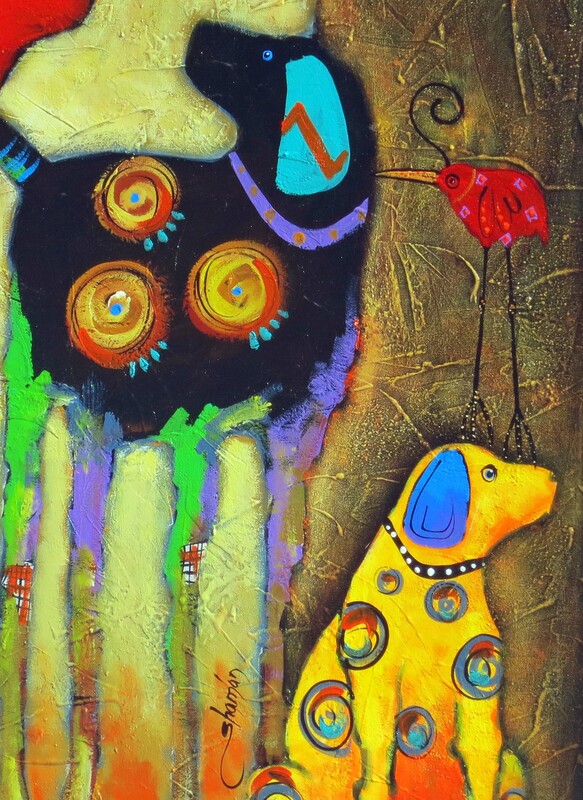 These dogs, created by an artist on the Malecon, were more colorful, and quieter. I also liked the red bird, but who knows what it was up to. Picking off fleas??? 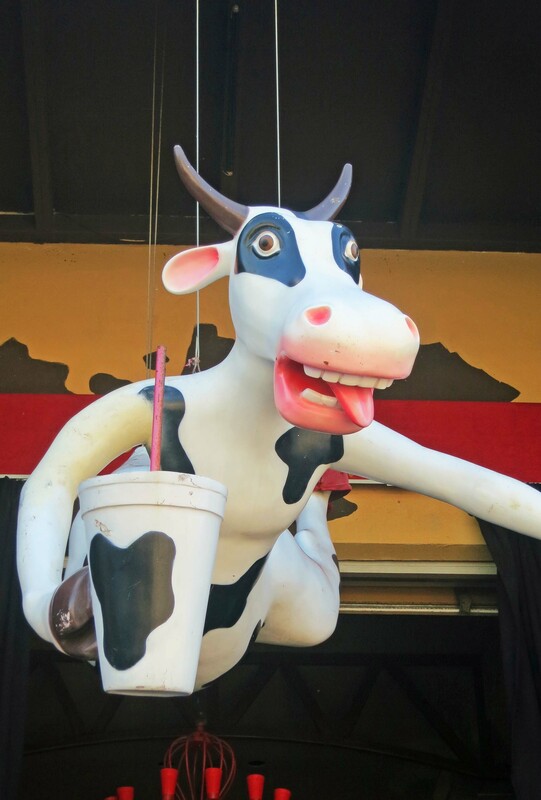 Also under the category of strange was this flying cow. As were these two cuties. Day of the Dead skeletons are common throughout Mexico. BTW, I swear I did not position my camera to catch the railing circles in such prime locations. I only discovered this fortuitous positioning when I went to post the photo. One thing we always check out is architecture. Peggy and I both like the adobe and tile look of Mexico and the Southwest of the US. 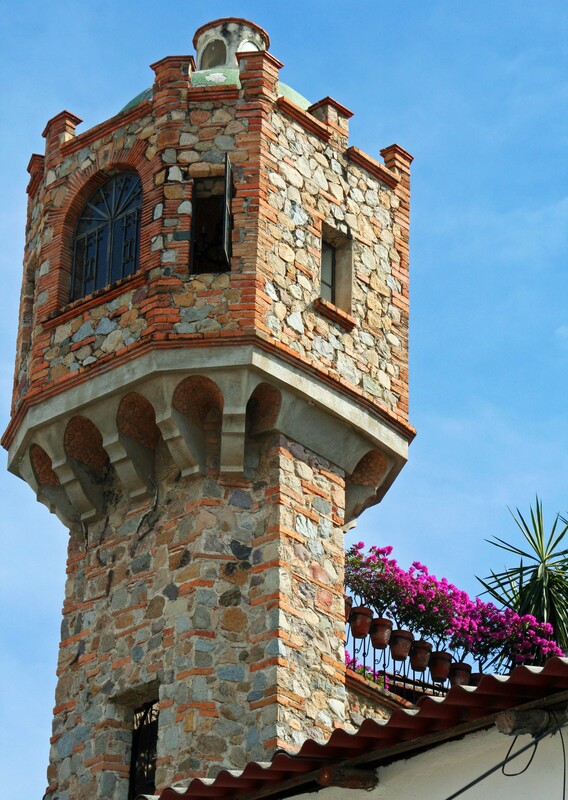 It seems that Puerto Vallartans like to add something extra on top of their homes, like the small room. Another thing: note the shoes hanging off the power line in the upper left hand corner, undoubtably thrown there by a teenager. Is this behavior worldwide? 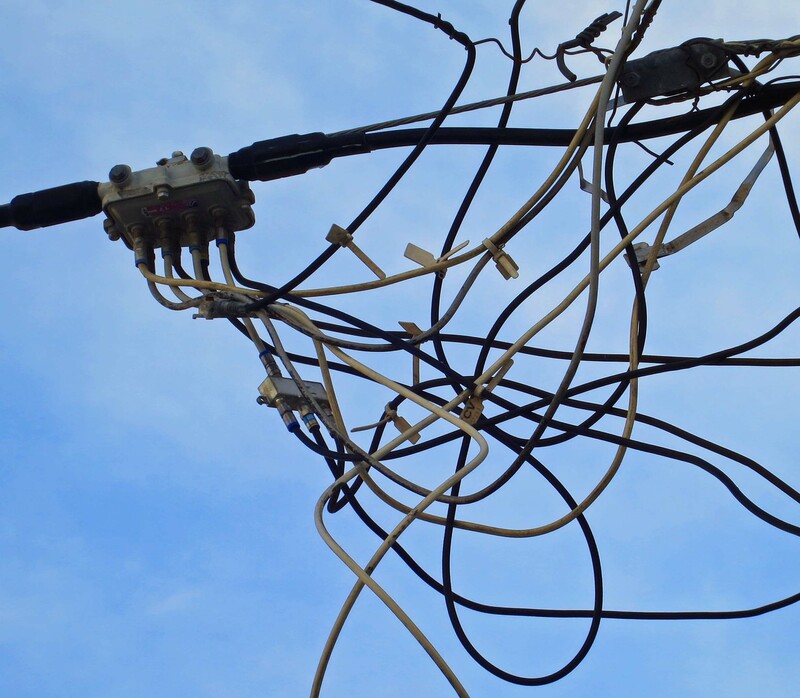 Speaking of power lines, it is almost impossible to take a photo in Puerto Vallarta without them. They run willy-nilly everywhere. If I remember my geography right, these two houses were where Richard Burton and Elizabeth Taylor hung out during the filming of the Night of the Iguana. 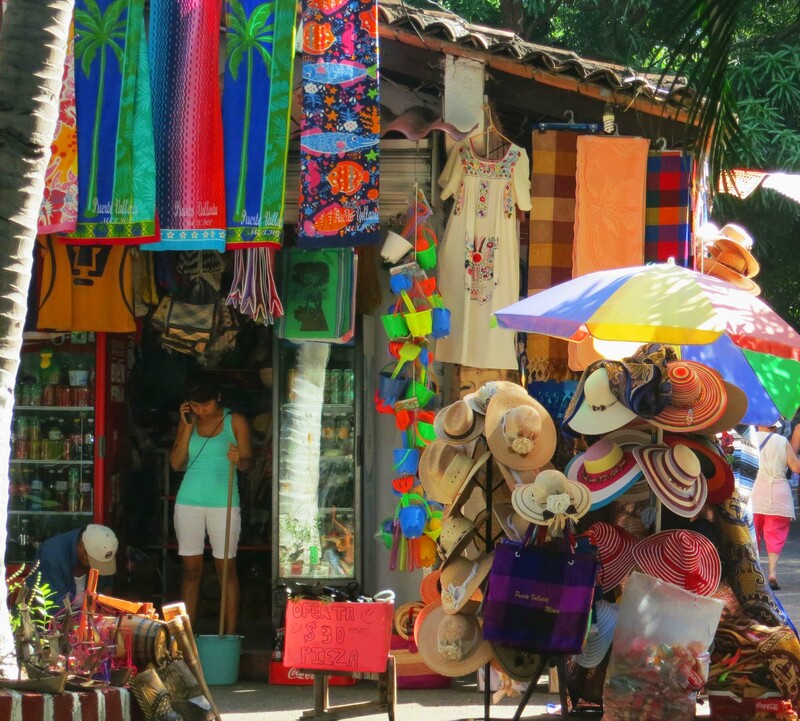 While there are expensive, high-end shops in Puerto Vallarta, the majority are open-air tourist meccas like this one. It seems like there are hundreds of them. The young woman on her cellphone would normally be outside soliciting people to come in and look around. Crafts people and artists are common along the Malecon. 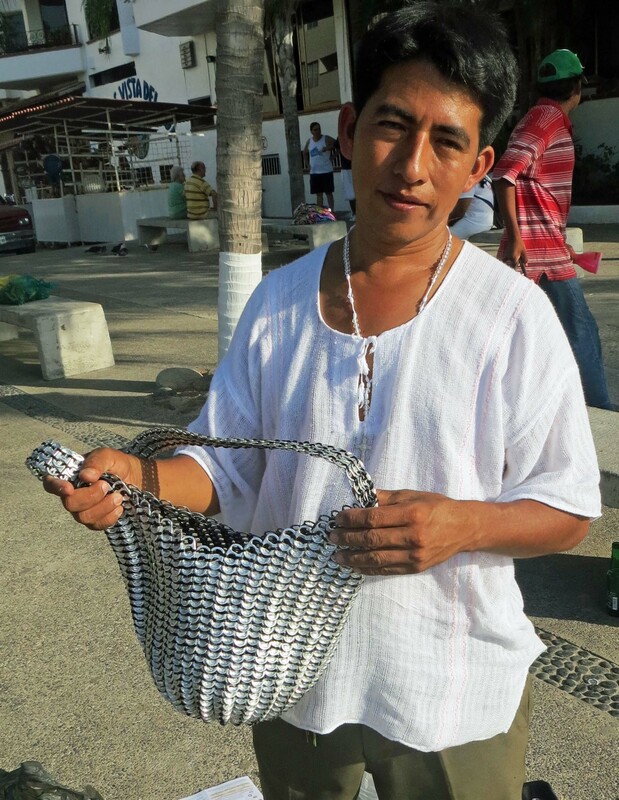 This young man featured purses and jewelry made from beer and soda can pop tops. 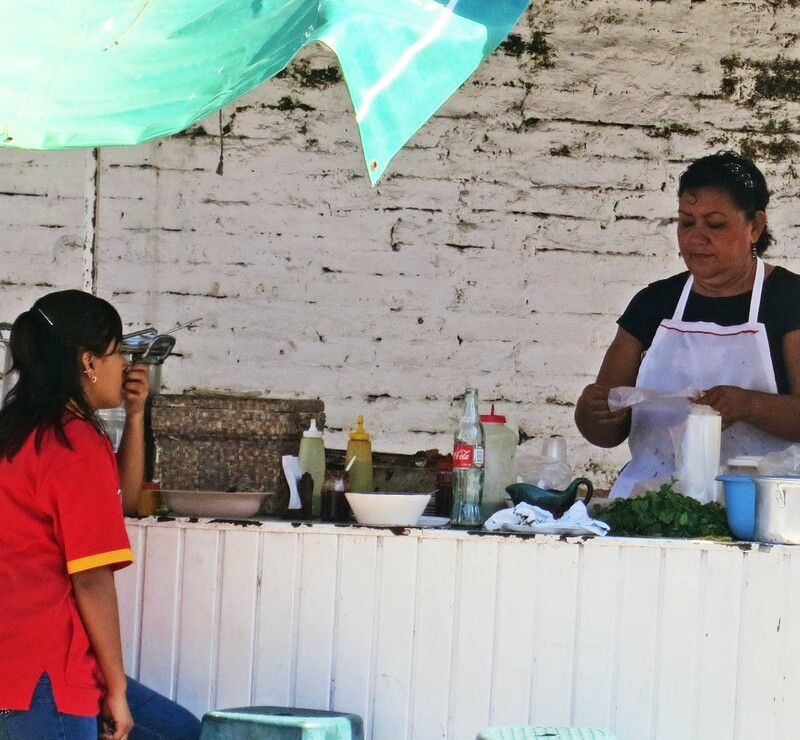 Street vendors selling food are also common. 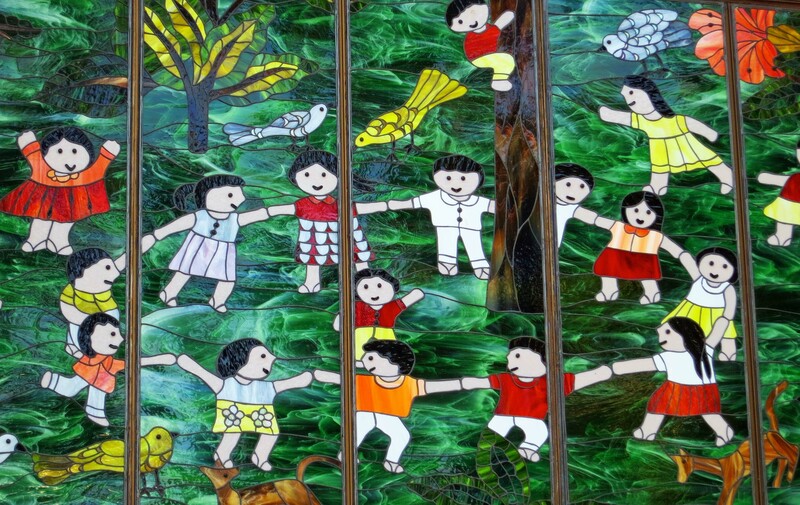 A close up showing children in a ring dance. Ring around Rosita? 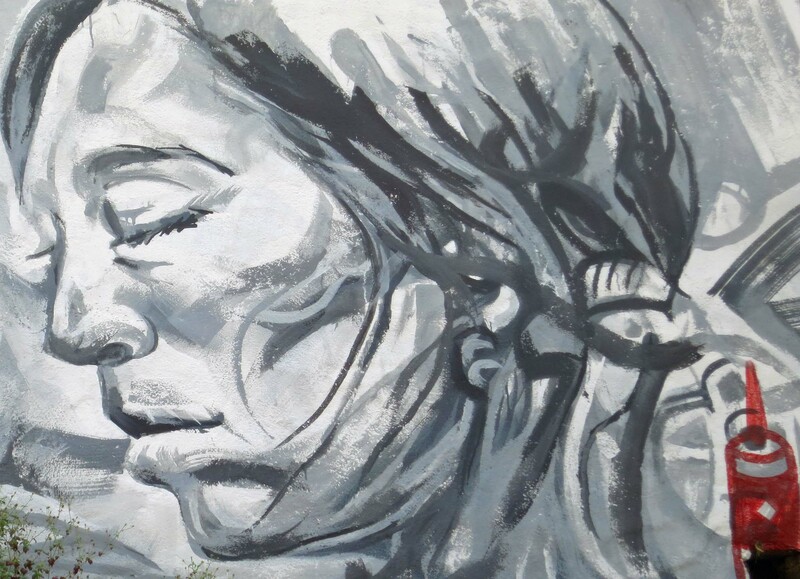 While most Puerto Vallarta murals feature ceramics, I found this painting of an indigenous person quite impressive. 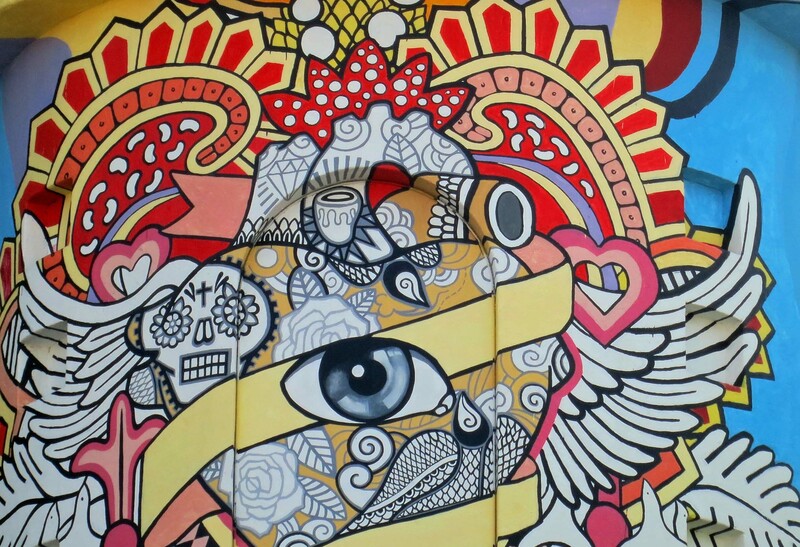 A close up of the mural on Artist’s Cafe. 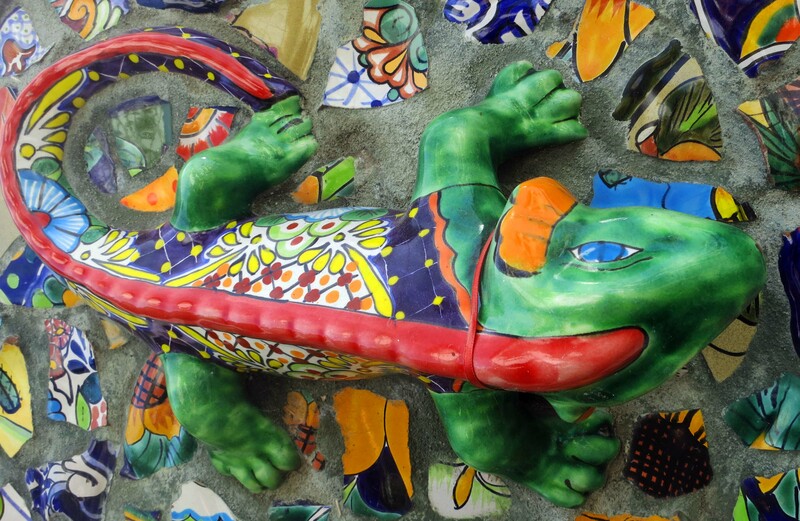 One mural incorporated a pair of iguanas including this handsome fellow. 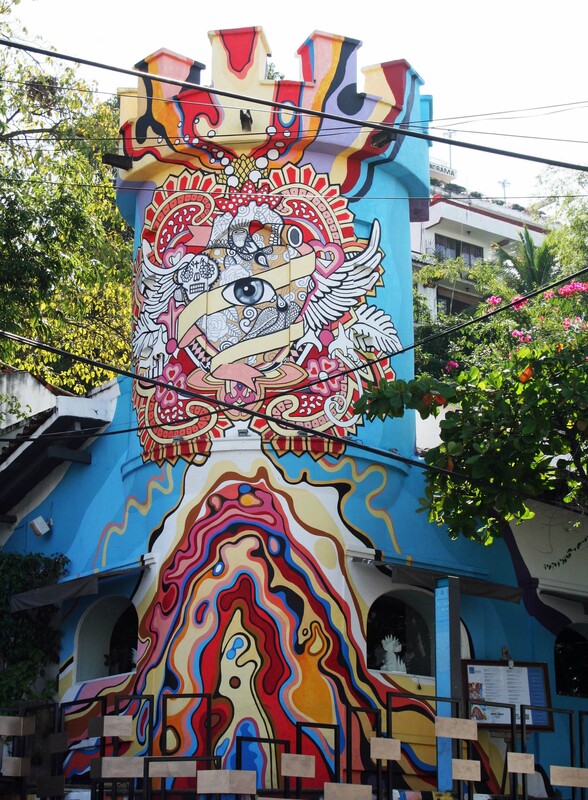 My favorite mural, and in fact my favorite art piece in Puerto Vallarta, is a 196 by 9 feet mural designed by Natasha Moraga. I understand it is under threat of removal by the government. Why, I don’t know, but it would be tragic. 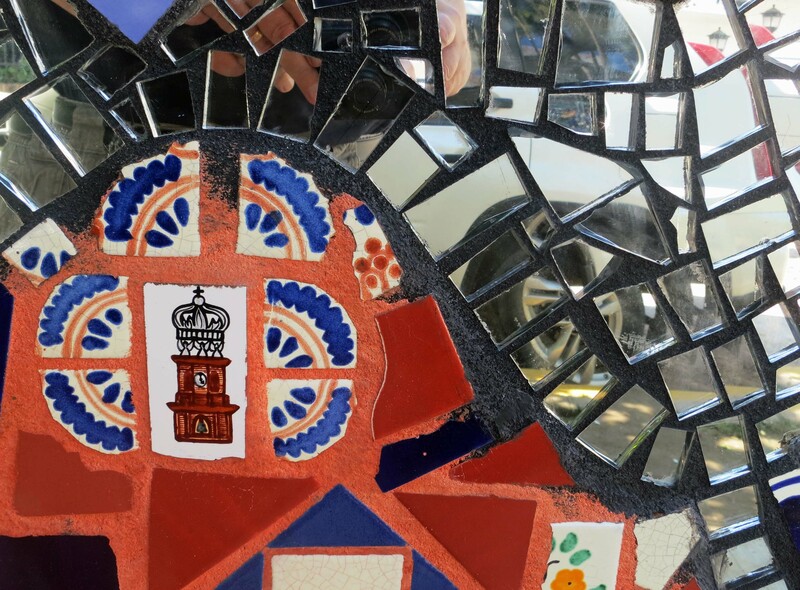 Made with tile and glass, the mural uses mirrors to reflect the street scene behind it, an effort that adds both beauty and interest. 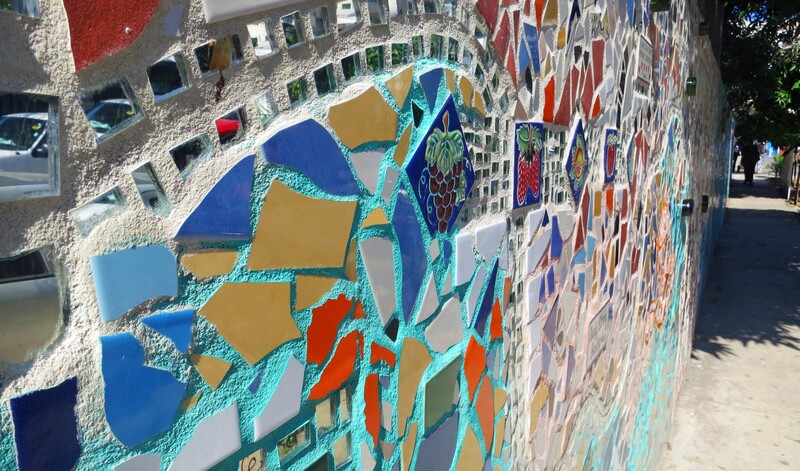 Numerous patterns and scenes are incorporated into the mural. This was one of my favorites. Major contributors are honored with their own tiles. 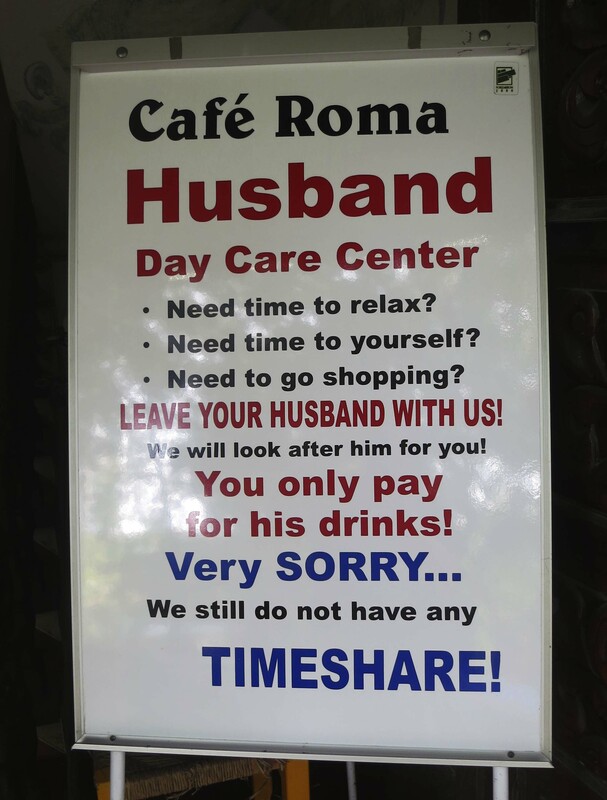 This one was amusing. 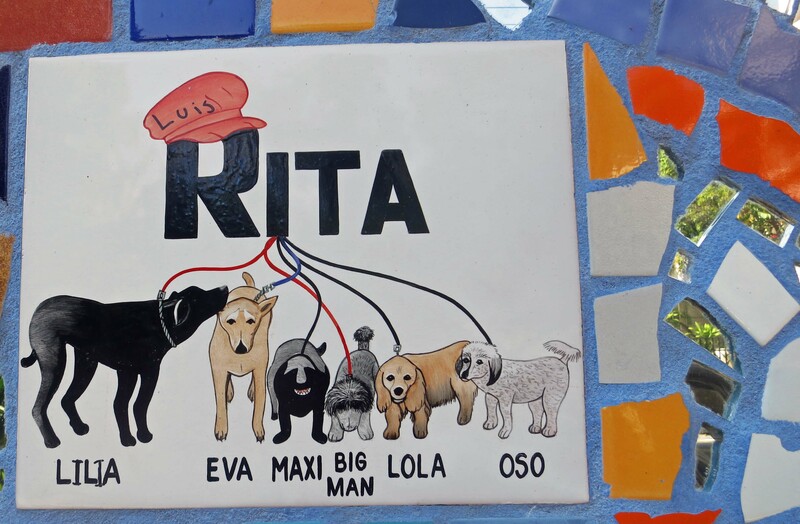 It appears Luis Rita has a house full of dogs. 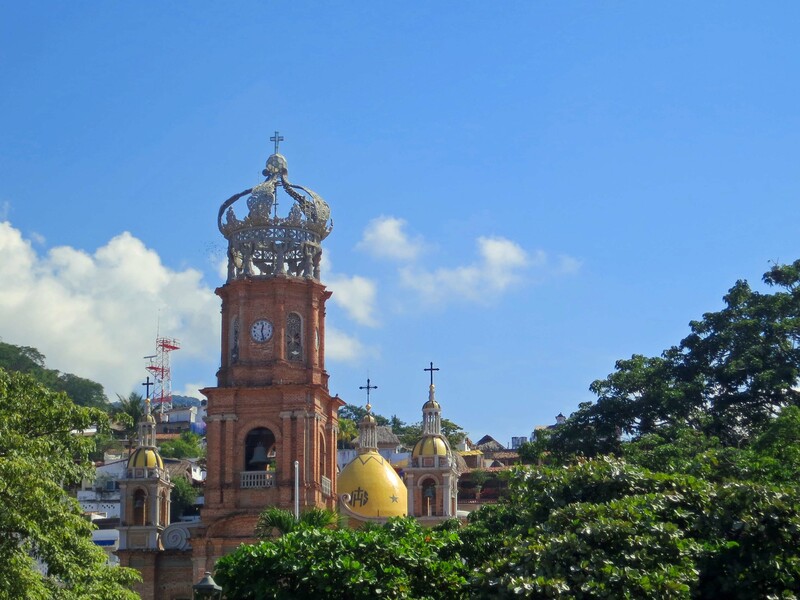 Most murals we found in Puerto Vallarta feature a rendition of the town’s primary landmark, the Church of Our Lady of Guadalupe, which I will feature in my next blog. 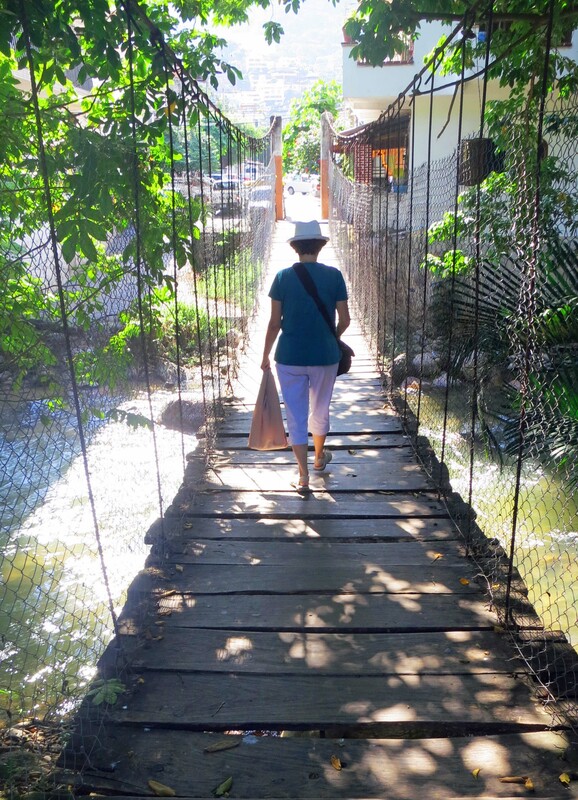 I’ll use this photo of Peggy crossing a swinging bridge as my last photo of our Puerto Vallarta walkabout. And believe me, the bridge does swing. 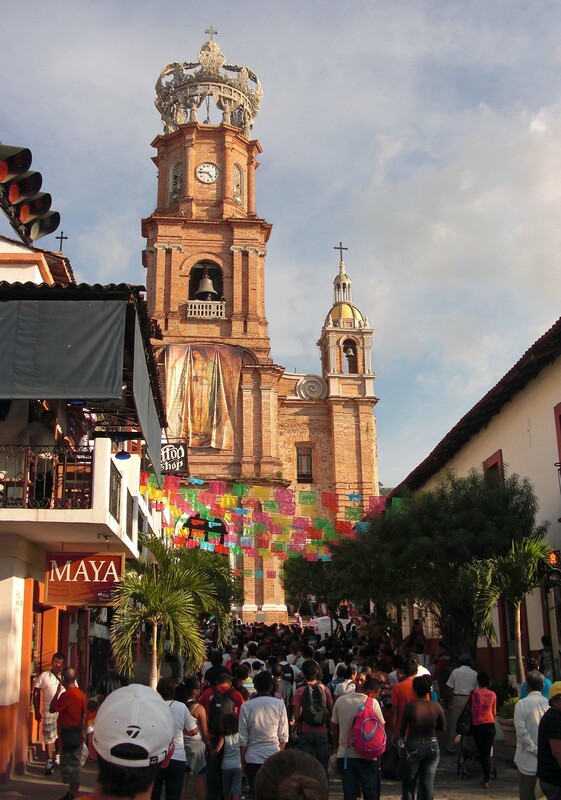 NEXT BLOG: Puerto Vallarta’s beautiful Church of Our Lady of Guadalupe. Peggy and I bought this Huichol yarn art painting several years ago. Yarn is pressed into beeswax to make the painting. This piece represents the Huichol’s annual journey to the sacred mountain of Wirikuta to gather peyote, which is central to their religion. My fascination with indigenous art was piqued again on our recent trip to Mexico. The Huichol Indians, one of the last tribes in North America that has preserved pre-Columbian cultural traditions, are noted for their brightly colored bead and yarn art. 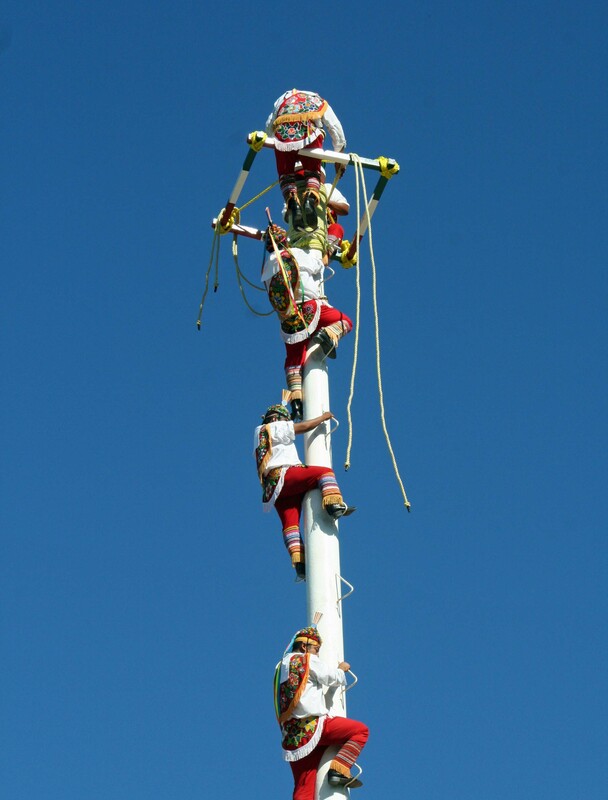 You can’t miss their work as you stroll down the streets and through the markets of Puerto Vallarta. 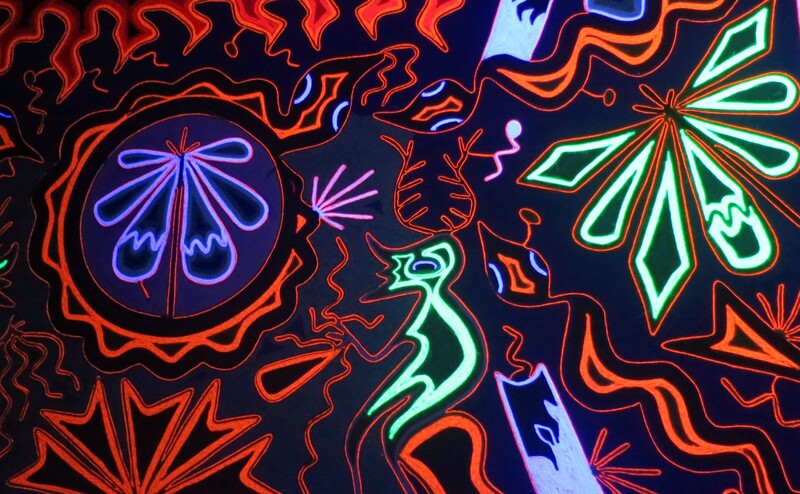 What most casual visitors don’t realize, however, is that the art incorporates shamanistic visions inspired by peyote. Each piece provides an insight into the religion and mythology of the Huichol. For example, the round buttons in the center of the painting above represent peyote. 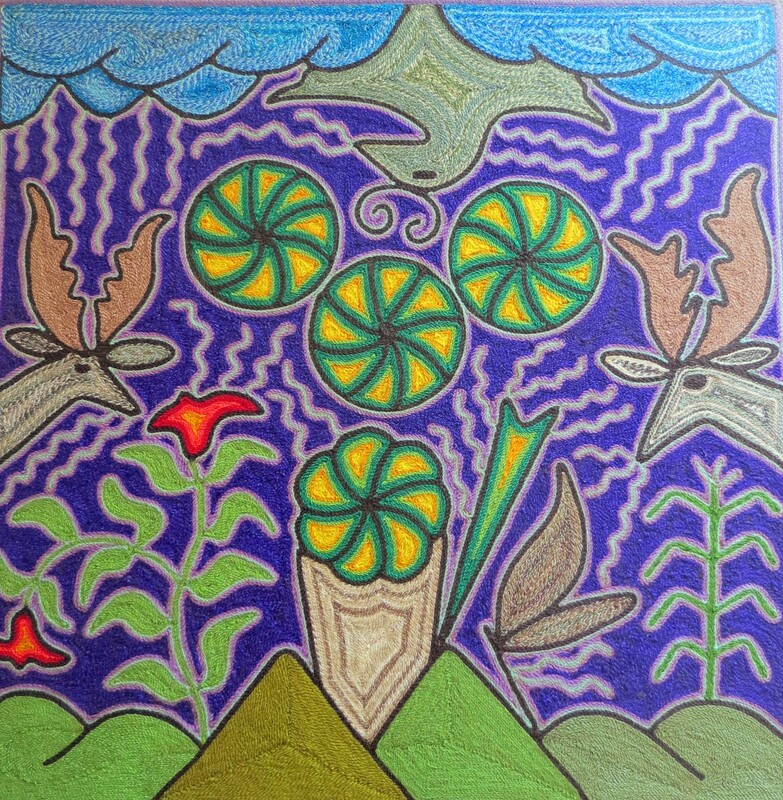 Just to the left of the peyote is the plant solandra, also with hallucinogenic qualities. The deer serve as intermediaries with the gods and the eagle serves as a messenger. Below the deer on the right is maize. To the left of the maize is what I believe is a prayer arrow with eagle feathers attached and to the left of that another arrow that has been shot into the base of a peyote plant. The wiggly lines represent communication that is taking place– between everything. 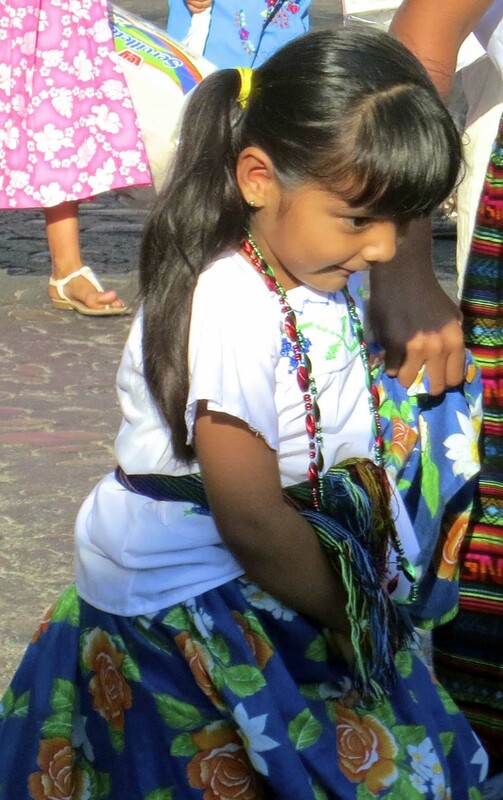 The Huichol, as they are known in Spanish, or the Wixaritari, as they call themselves, live in the Sierra Madre Occidental Range of Mexico. 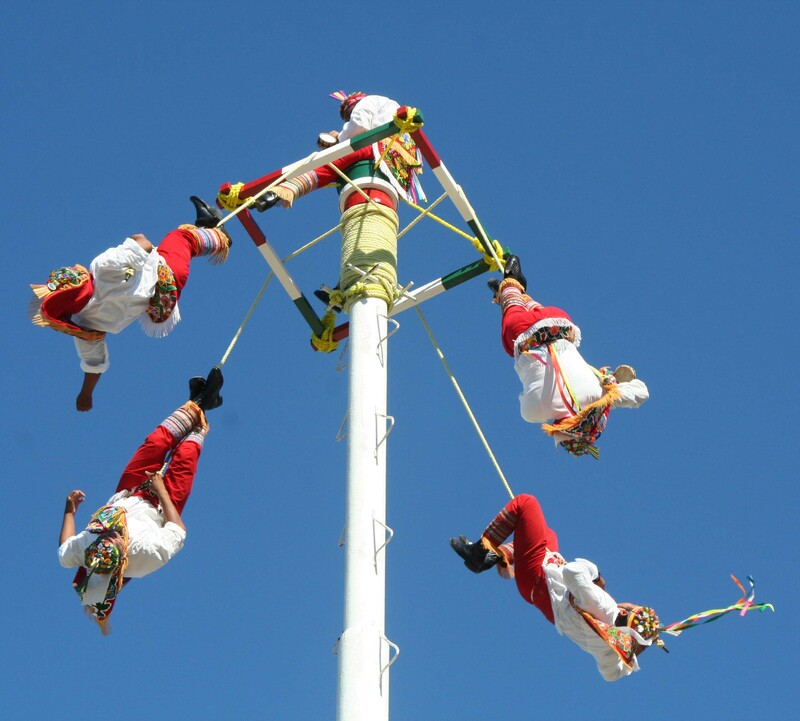 Each year, representatives of the tribe make a journey of several hundred miles to the sacred mountain of Wirikuta in central Mexico where they gather peyote. Peyote is a small cactus with psychoactive alkaloids, particularly mescaline, which can create hallucinogenic reactions similar to those created by LSD. (If you’ve been around for a while, you will immediately think of Timothy Leary and the 60s.) 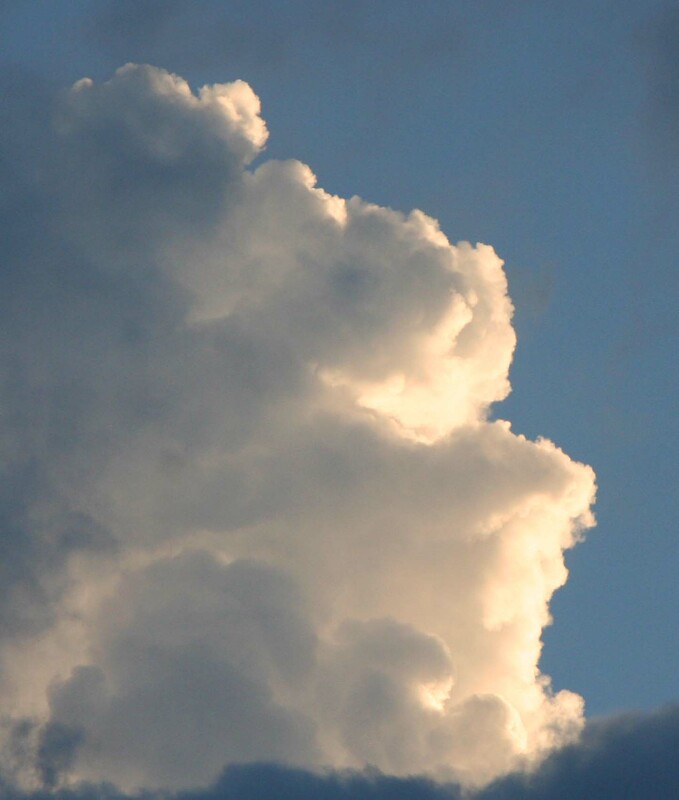 Effects include alterations in the thinking processes, sense of time, and self-awareness. 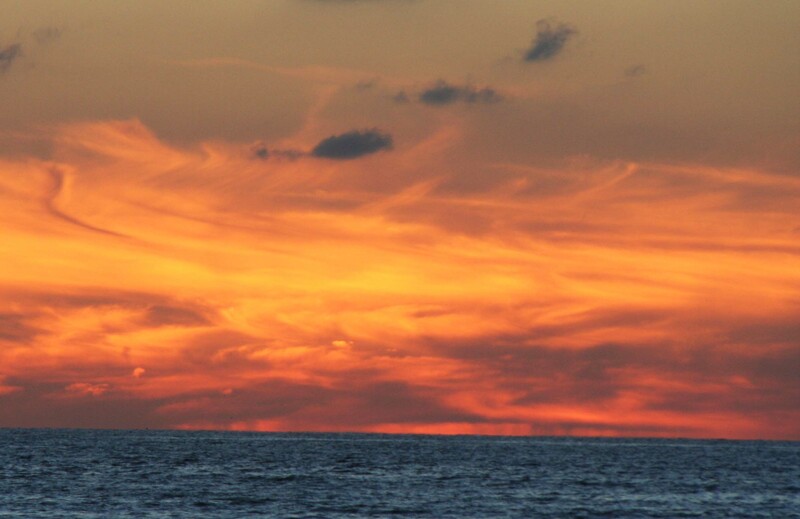 Colors are said to appear brilliant and intense. Synesthesia, where senses interact, may also occur. An example of the latter is seeing colors when listening to music. 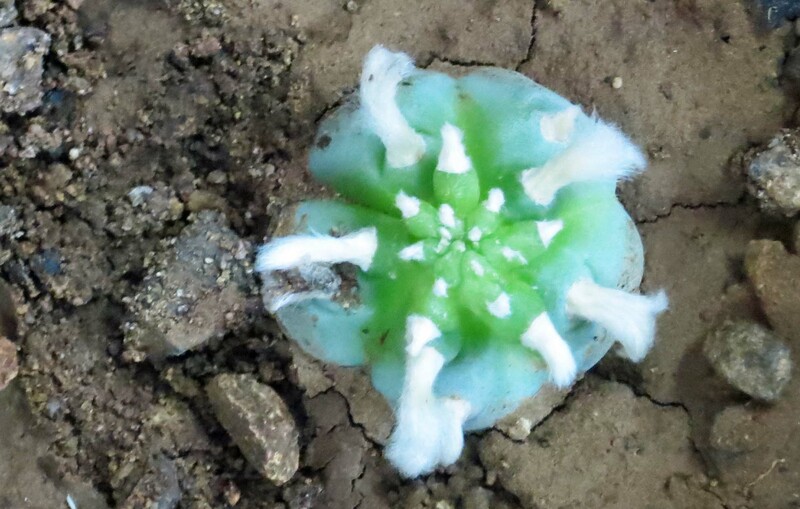 The peyote plant is a small, spineless cactus that contains mescaline, a hallucinogenic drug. 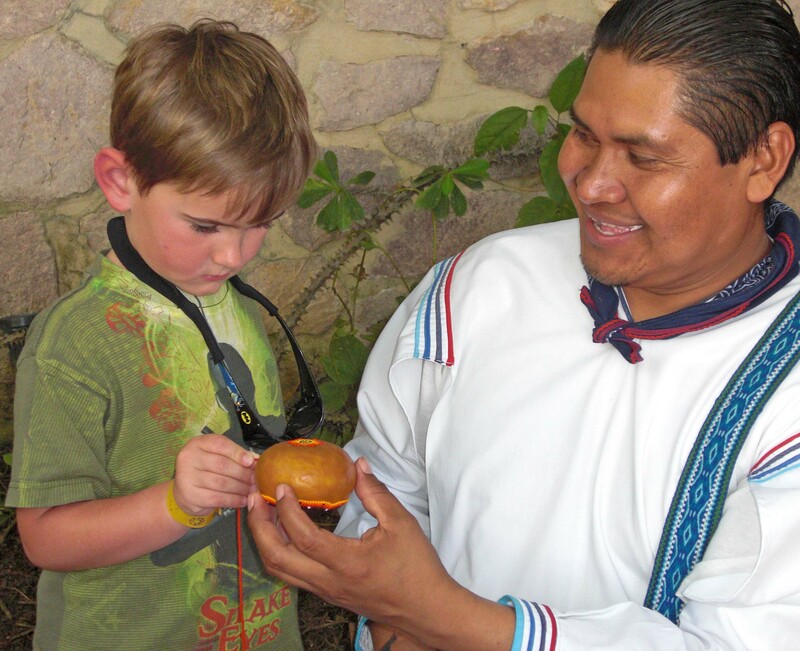 Huichol Shamans use the peyote to enter a trance where they communicate with the gods of the Huichol people. The shamans then make small yarn paintings known as Nierikas that represent the visions they experienced. The paintings are left as offerings to the gods in caves, temples and streams. 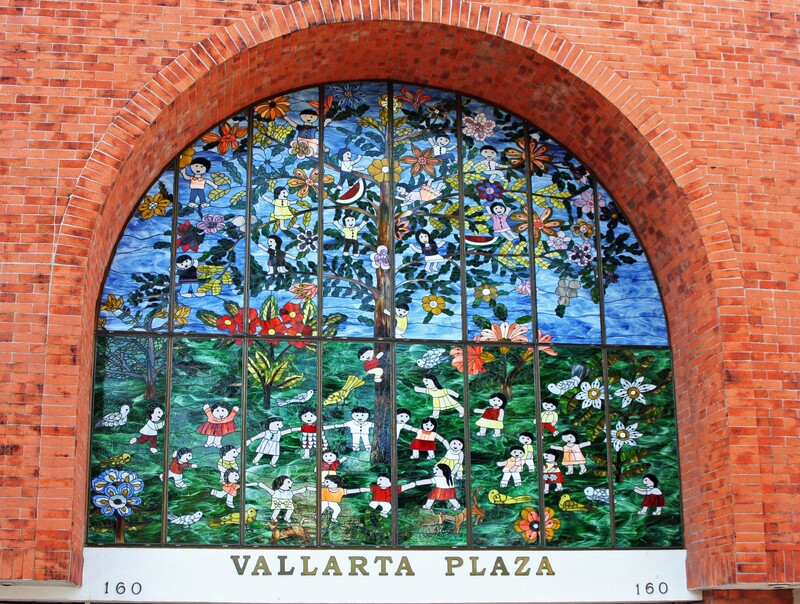 The Nierikas serve as the foundation for the Huichol art found in Puerto Vallarta, Guadalajara, and other urban locations. We have bought several pieces of the art, as has our daughter, Tasha. Our favorite Huichol artist for small bead art, Ernesto, maintains a table along the Rio Cuale. This year he took time to let our grandson, Cody, press some beads into a piece he was working on. 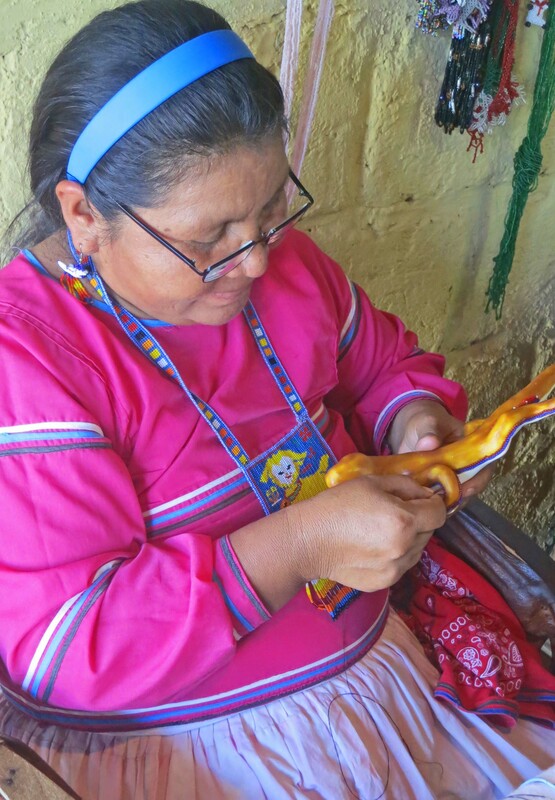 In this photo, a Huichol woman works on another bead art sculpture. 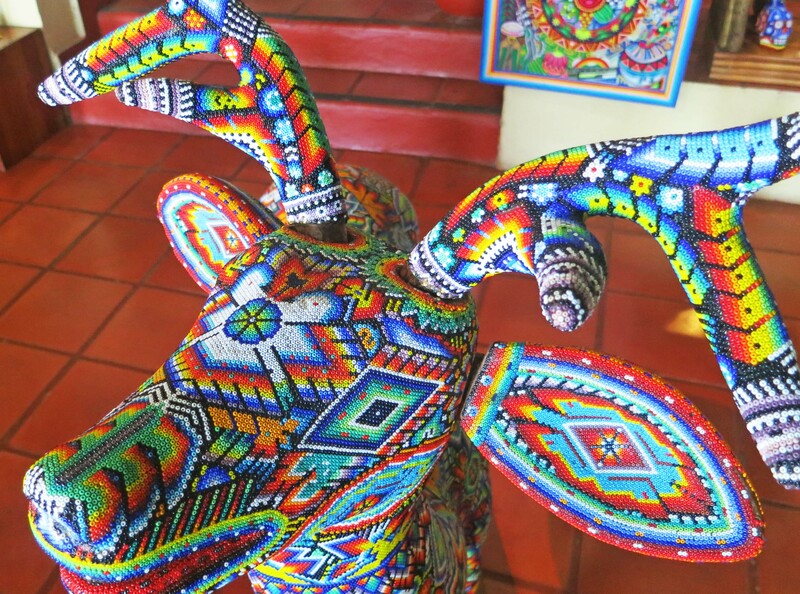 Beaded Huichol art can range in size from these small pieces created by Ernesto to much larger sculptures such as the deer shown below. 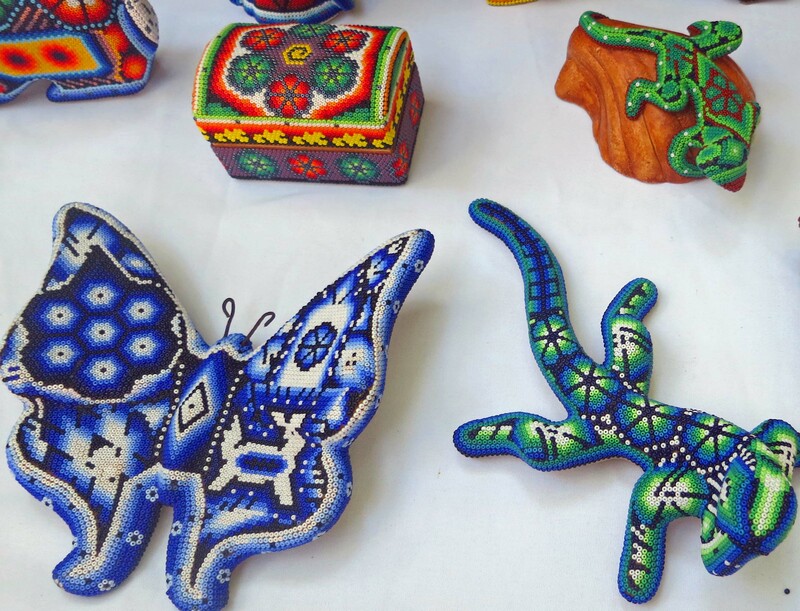 Beaded art, like the yarn art, includes symbols of the Huichol Indians’ religion. The salamander, with peyote buttons marching down its back, helps bring rain. 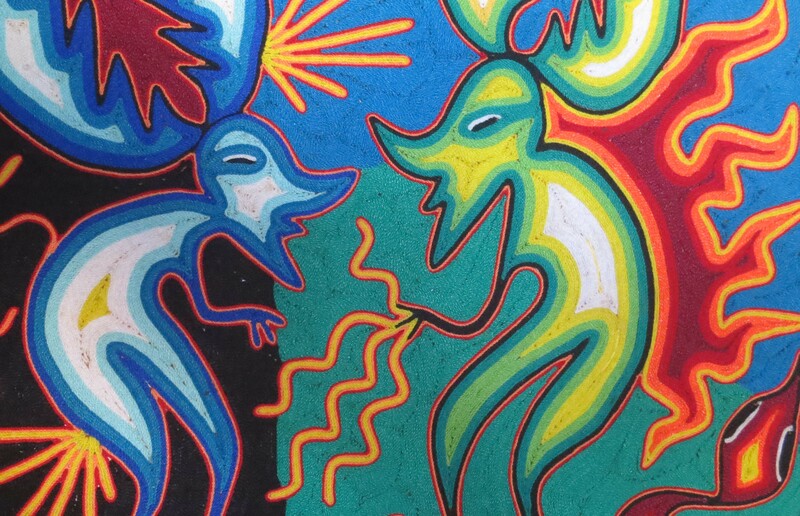 I’ll conclude today’s blog with several examples of Huichol yarn art which demonstrate the vibrant colors and spiritual figures seen by shamans while in trance. Deer person in center represents a shaman. The iguana I named Big Orange was staring up at us with a curious eye. He had come down out of his tree and shuffled over to where we were having lunch on a patio above the Rio Cuale. My eight-year-old grandson, Ethan, was scratching the wall to attract his attention. The iguana and the boy seemed equally interested in each other. Another shot of the curious iguana. I named him Big Orange because of his color. These large lizards can grow to be over 5 feet long. 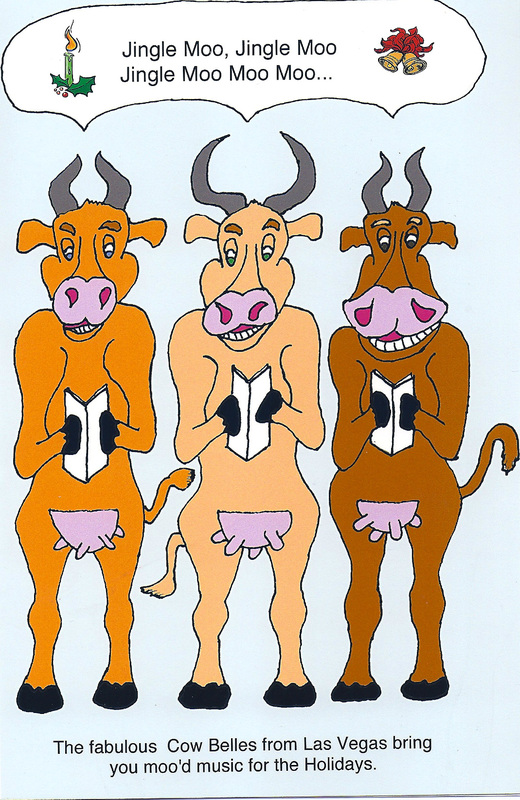 If their tastes tended toward meat, they might be worrisome, especially given their fearsome appearance. 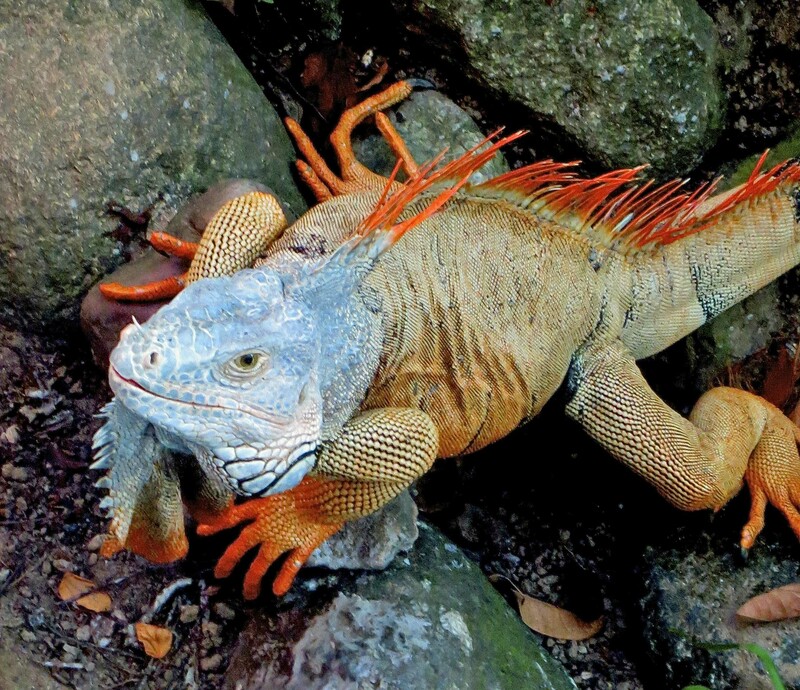 But iguanas are vegetarians and prefer to avoid conflict. Still, you wouldn’t want to irritate one; their lightning fast spiky tails and sharp little vegetarian teeth can do considerable damage. 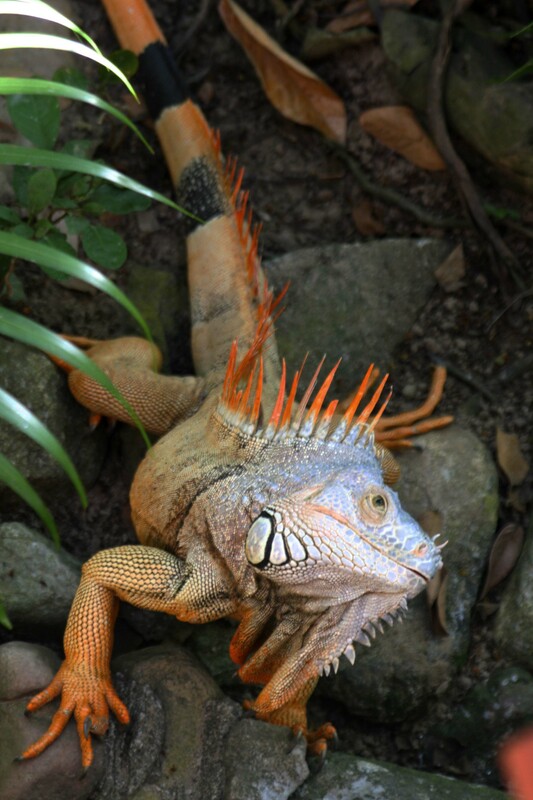 I, for one, would hesitate to get in an argument with the iguana I named Big Orange with his spiky tail, long claws and his tiny, but sharp teeth. They also have a third eye, located on top of their heads. As eyes go, it is rather primitive. 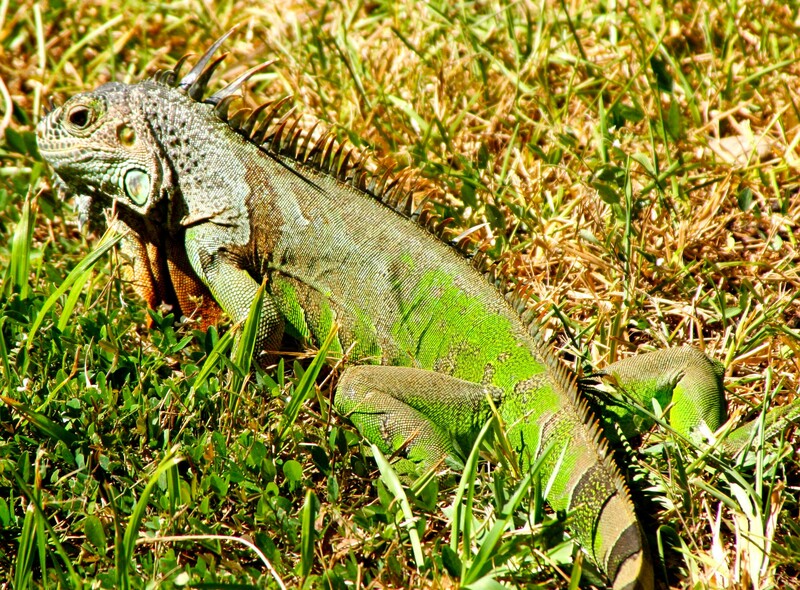 Cells sensitive to light and dark can warn an iguana when something is blocking the sun, such a hawk hovering over its head. One way of escape is to fall out of the tree. If there is a river underneath, you might call it a dive. 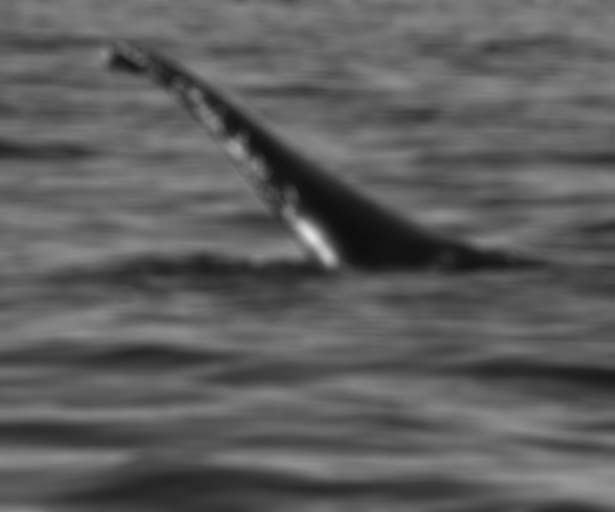 They are good swimmers and use their powerful tails for locomotion. 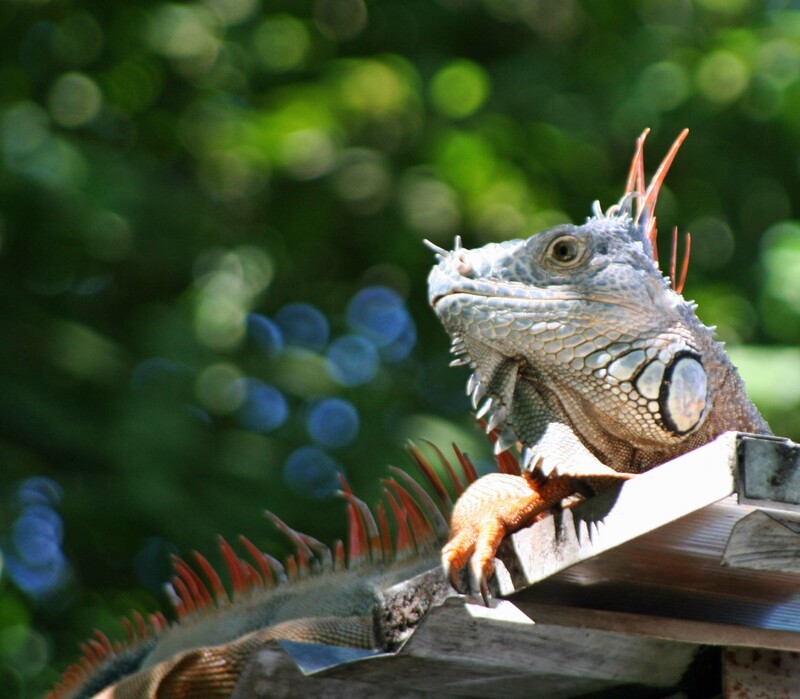 The small oval on top of the iguana’s head serves as his third eye and is sensitive to light and dark. This photo also shows Big Orange’s leaf-eating teeth. If a convenient river isn’t present, they land on the ground with a loud plop. Peggy witnessed one such fall. It was a little close for comfort. She was living in Panama at the time with her first husband. Our daughter Tasha, Ethan and Cody’s mom, was splashing around in a baby wading pool in the shade of a palm, when one of the big guys fell out of the tree and crash landed next to the pool. “The iguana landed flat and seemed stunned. Then he stood up on his legs, shook his head, and wandered off.” Apparently iguanas can fall for up to 50 feet and survive. Whether baby Tasha could survive an iguana falling 50 feet and landing on top of her was another issue. Peggy moved the pool. 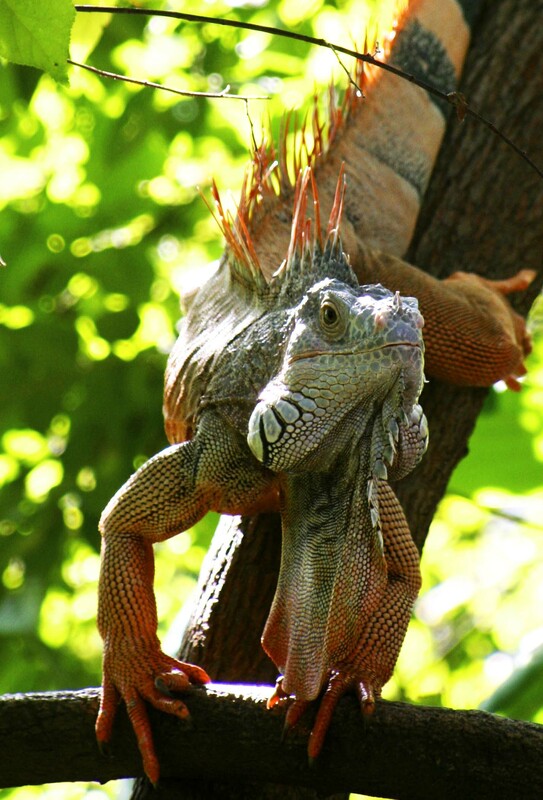 Iguanas are arboreal (live in trees). A convenient roof will do in a pitch, however. One of the stranger aspects of iguana physiology is a rather large dewlap that hangs down from the chin. I am surprised Big Orange didn’t stumble over his. Male iguanas bob their head and shake their dewlap when trying to impress a lady iguana. They also do the same thing to scare off the male competition. It must get confusing at times. 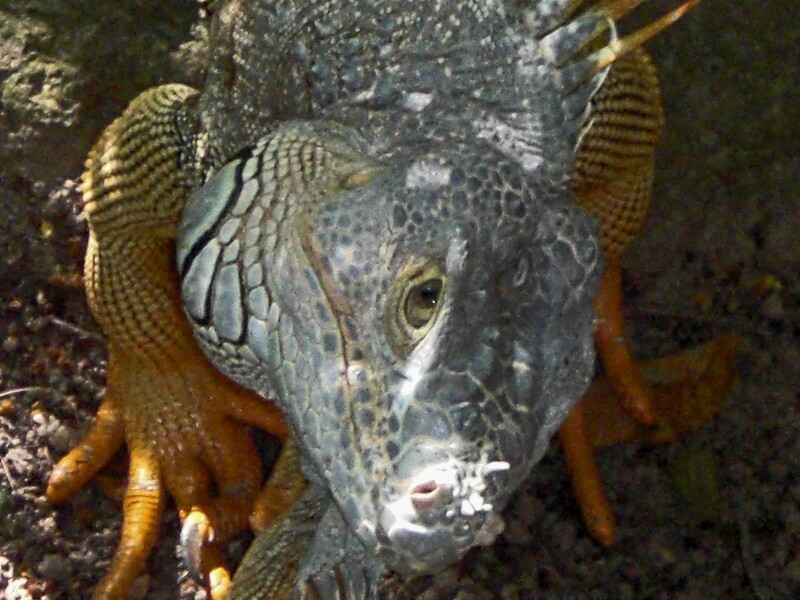 Check out the large dewlap on this iguana. The loose skin hanging down from his chin does double duty, both attracting females and scaring away males. This guy was bobbing his head and shaking his dewlap at a lady iguana. Human-iguana interaction goes in two very different directions. 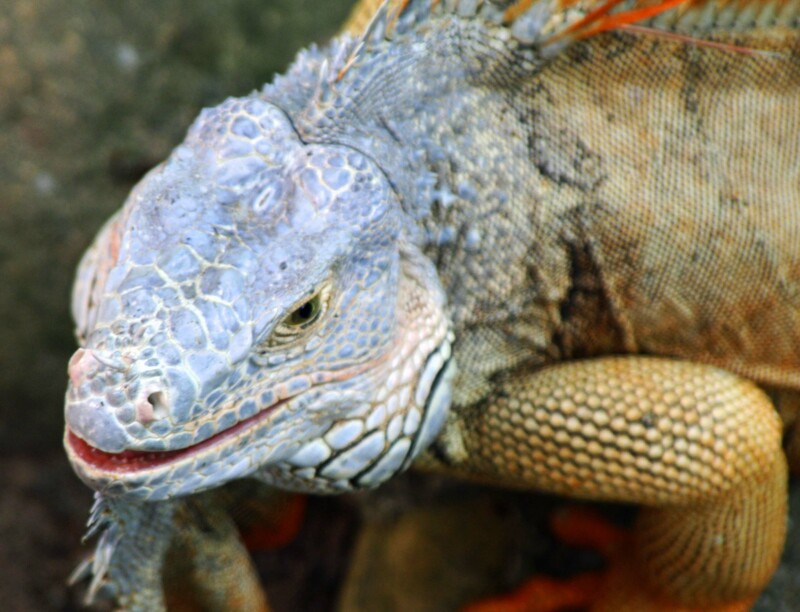 One, iguanas are used as pets. Their normally benign disposition and bizarre looks makes them quite popular. The downside here is that they require an unusual diet that pet owners frequently fail to provide. Two, they have served as a source of food in South America for over 7000 years. A common name is gallina de palo, which translates chicken of the tree. And yes, you guessed right. They supposedly taste like chicken. I’ve never eaten an iguana but I did eat a rattlesnake once that tasted like chicken. Eating it, however, was like chewing a rubber band. In addition to the iguanas that hang out in the middle of Puerto Vallarta on the Rio Cuale, we had a family in our back yard. The challenge each morning was to try to find where these arboreal lizards were hiding out in the trees. Later in the day they would come down and graze on our grass. Clover was in high demand. “Come quick, Curt,” Peggy urged. 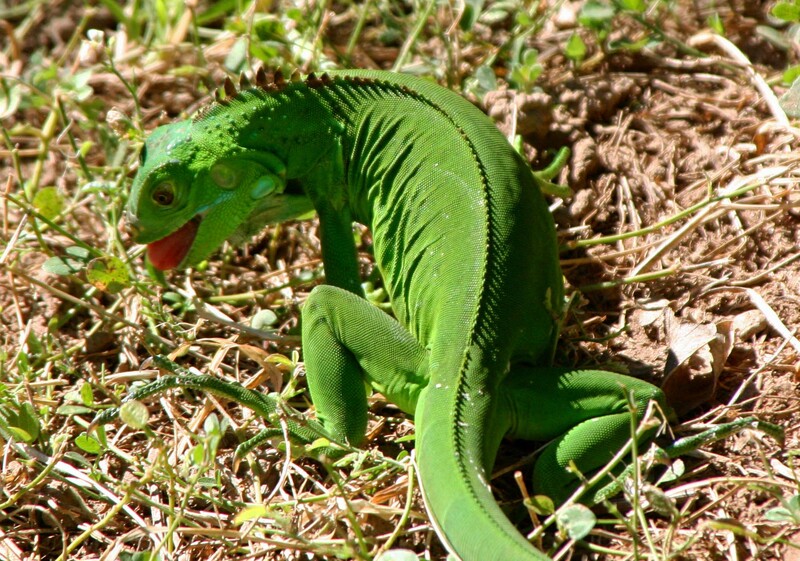 A Green Iguana had come down from its tree and was grazing on the grass in our yard. The grass-eating iguana ignored me for the most part, until I tried to sneak up on her for a photo. I got the eye. It was pretty much the same look Peggy gives me when I am misbehaving. 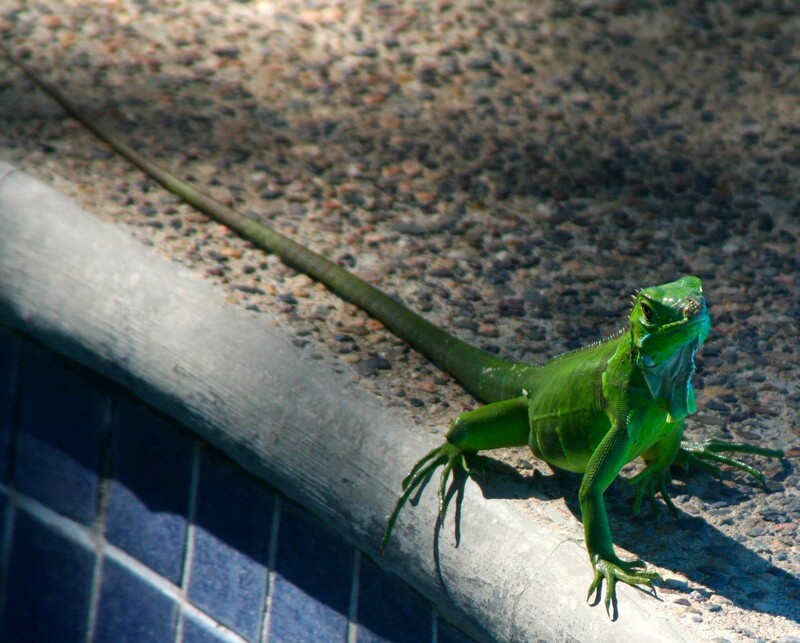 While I was sneaking up on the Green Iguana, this youngster came scurrying out next to our pool. Having satisfied itself that I was not dangerous, the young iguana returned to grazing on our grass. He is about to chomp down on a tender clover leaf. 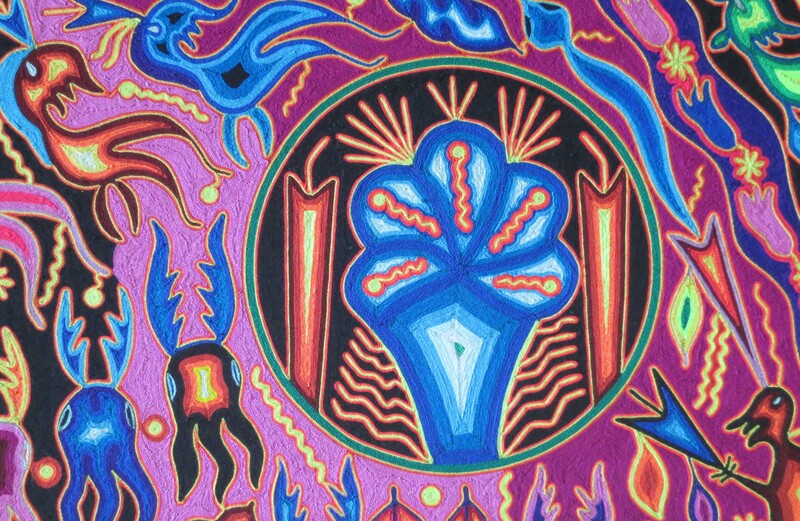 NEXT BLOG: The peyote influenced art of the Huichol Indians. 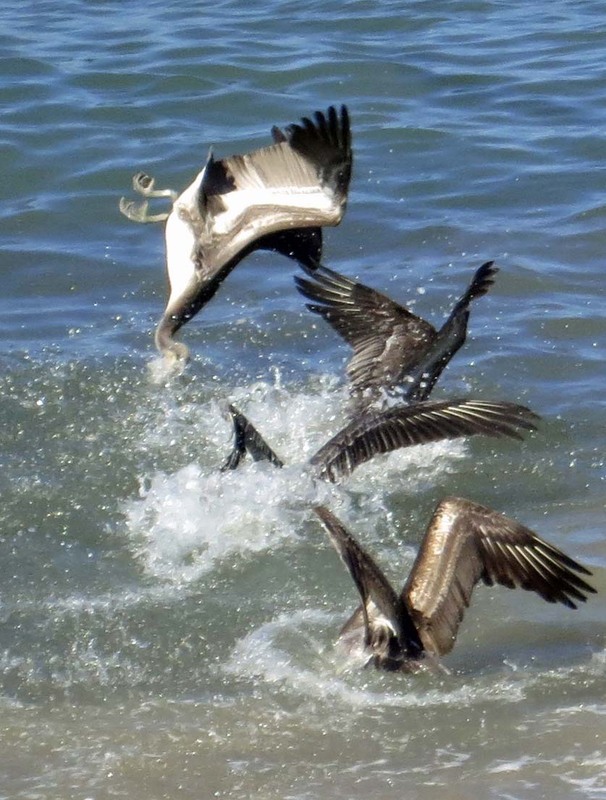 A Brown Pelican executes an amazing upside down dive to catch fish in Puerto Vallarta as three other pelicans join in the feeding frenzy. 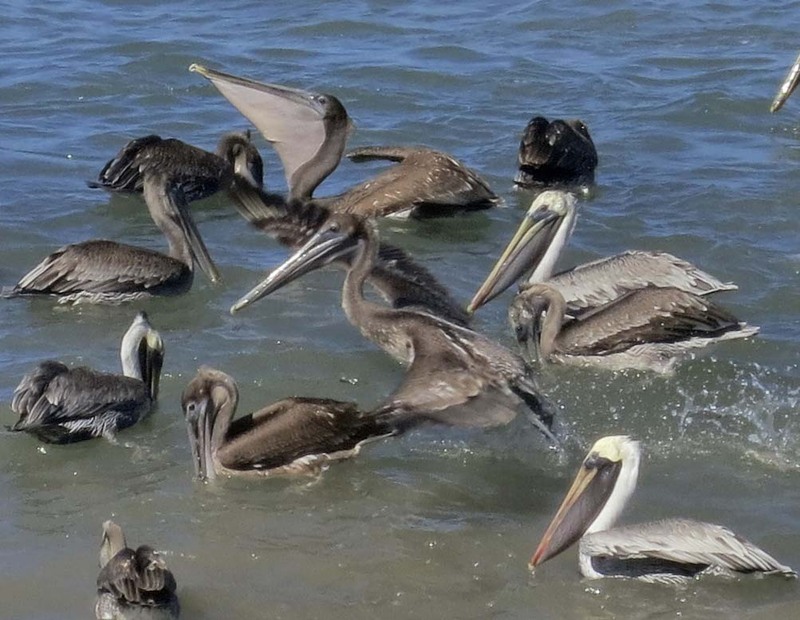 I am enamored with pelicans. 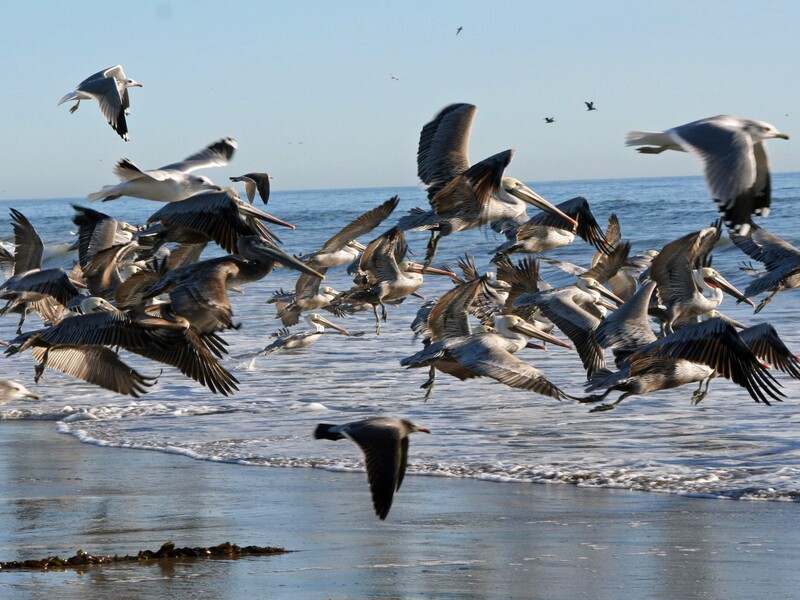 These large, gregarious birds that appear to have been created by a committee, skim over the ocean in graceful lines, fly in V formations to distant locations, and crash into the ocean with abandon to catch fish. 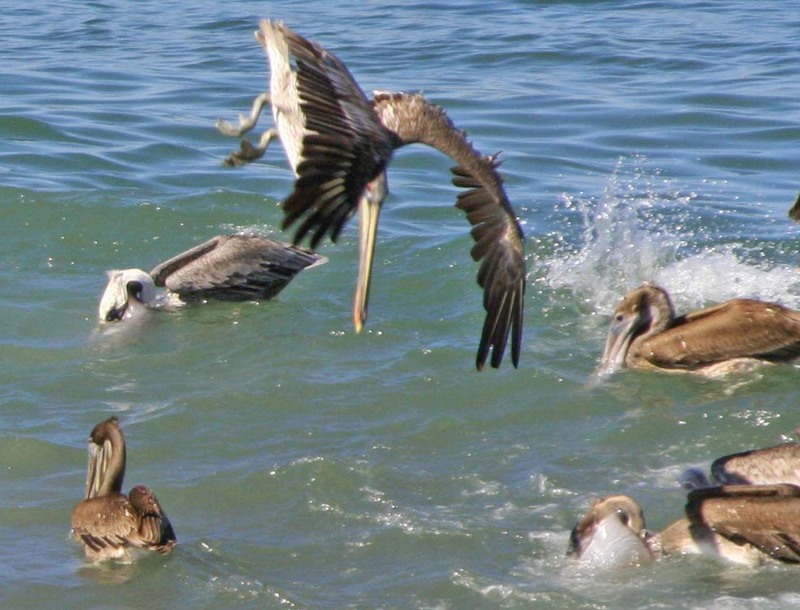 Most of my pelican viewing has taken place on the coast of California and Oregon but I have also enjoyed their antics in Florida and the Mediterranean. 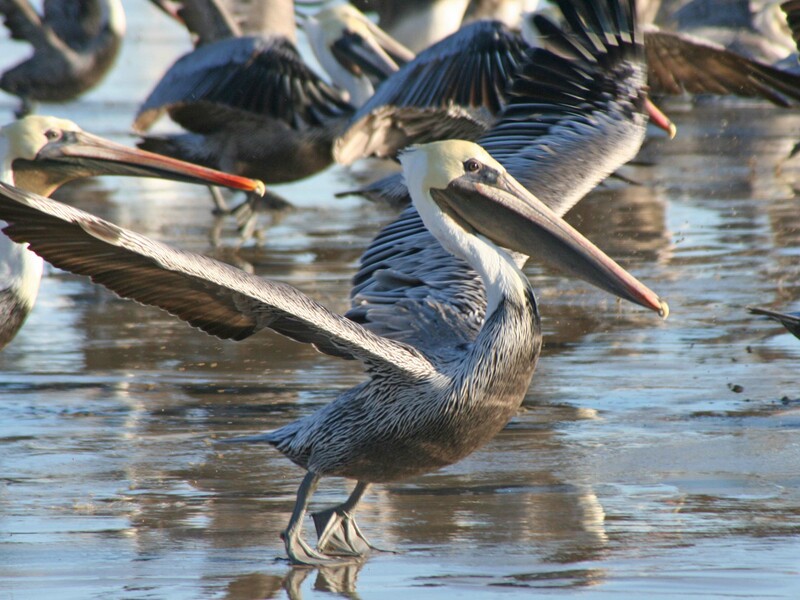 A Brown Pelican stands on its toes and prepares for flight in California. I called this photo flight-line. Shortly afterwards, I caught this photo of the pelicans, along with seagulls in flight. 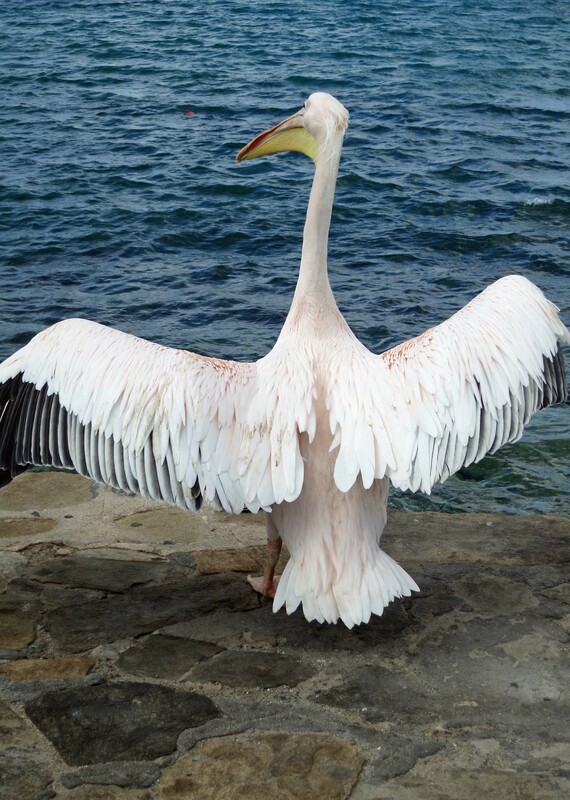 We found this Great White Pelican named Petros holding court on the Greek Island of Mykonos last year on our trip through the Mediterranean. 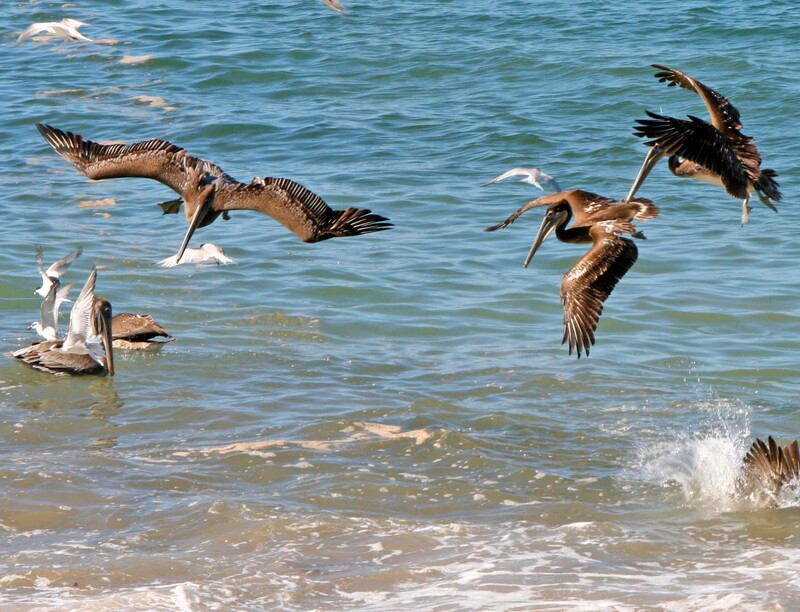 Over the past three weeks I have been enjoying pelicans in Mexico. 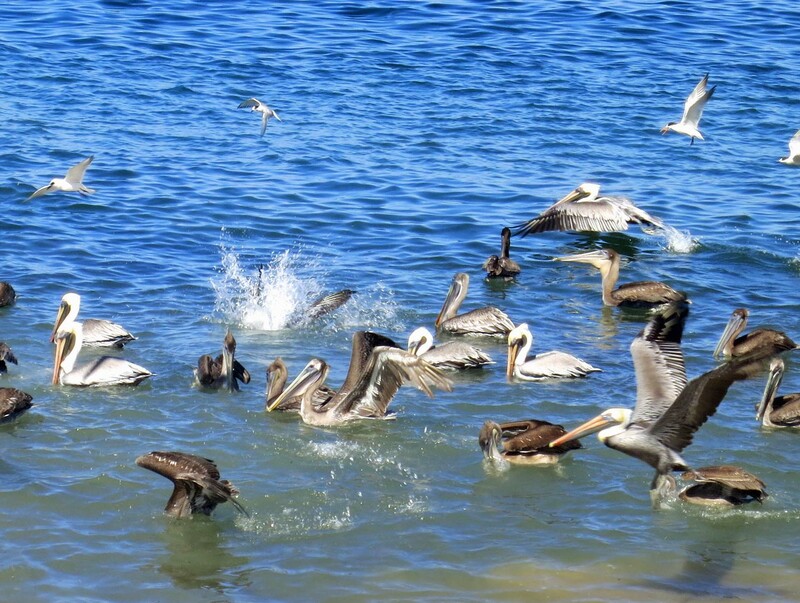 Peggy and I were particularly lucky to find a large flock of them involved in a feeding frenzy right next to Puerto Vallarta’s boardwalk, the Malecon. 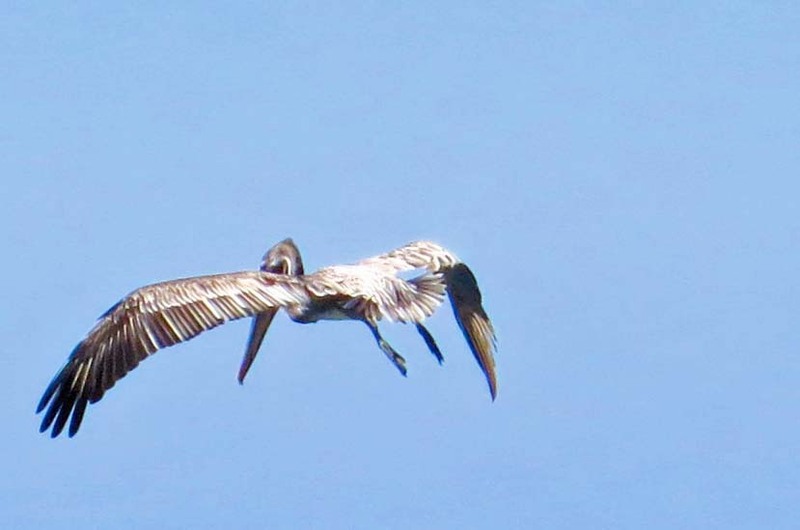 I’ve often watched pelicans make their unique dives from a distance; this was up close and personal– as I hope our photos demonstrate. I was also able to videotape them and captured 15 plus dives in a few seconds. The action was wild! 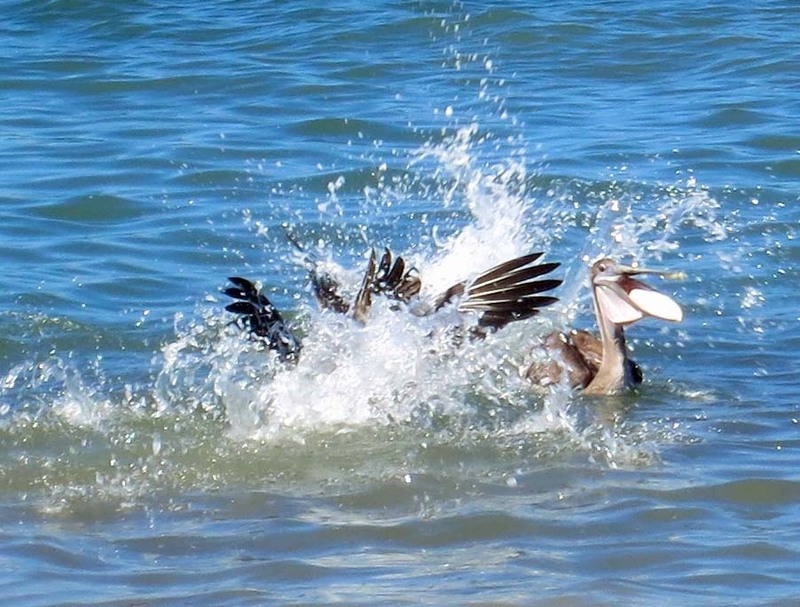 One pelican seems to float in open-billed-amazement as two other pelicans crash into the ocean. 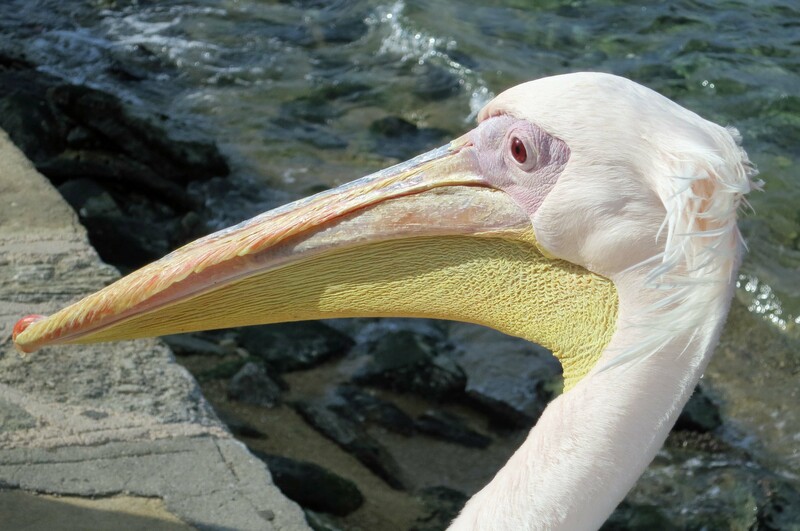 Actually pelicans have to drain the water out of their mouths before swallowing their catch, which is what this fellow is doing. 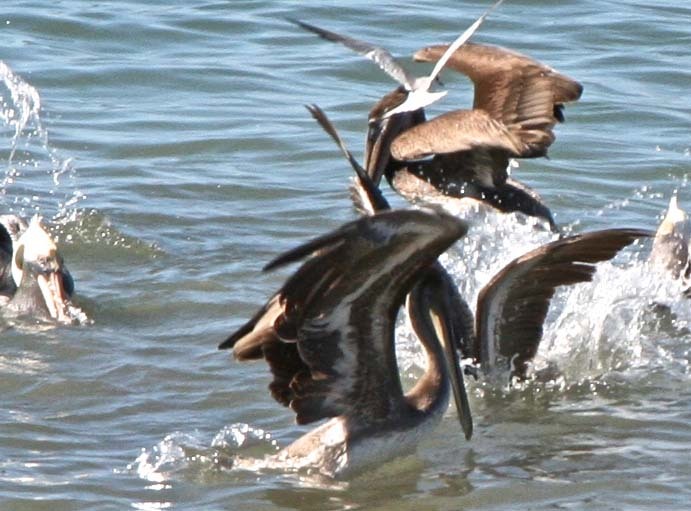 Check out the size of the Brown Pelican throat pouch here. Hovering in flight, pelicans prepare to dive. (Photo by Peggy Mekemson.) 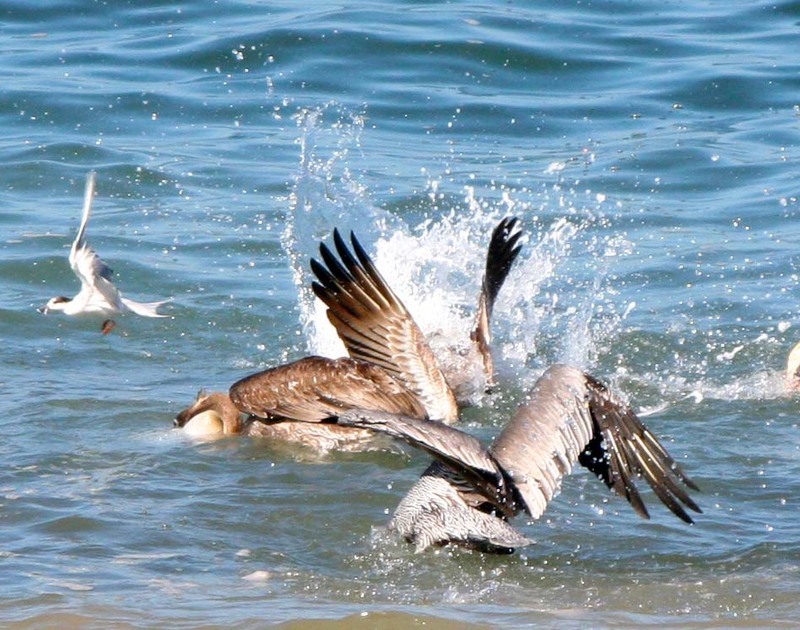 The terns, BTW, are hoping to participate in the feast and will happily steal fish from the pelicans. 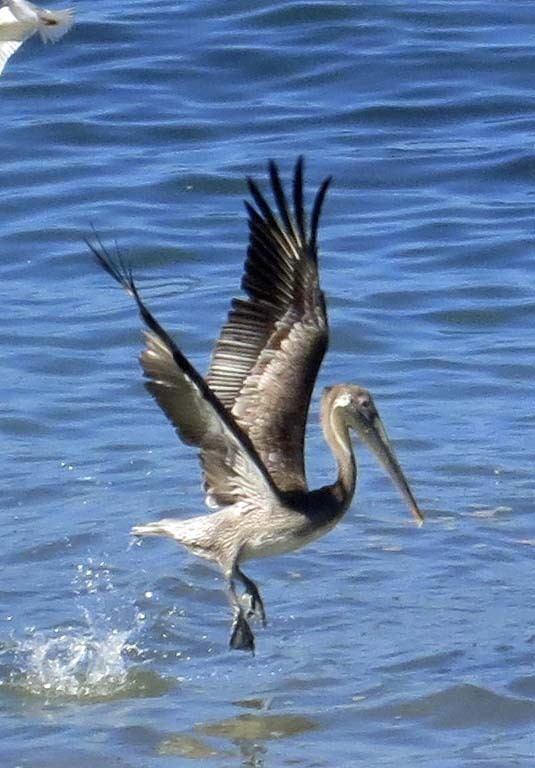 Brown Pelican takes off from water. 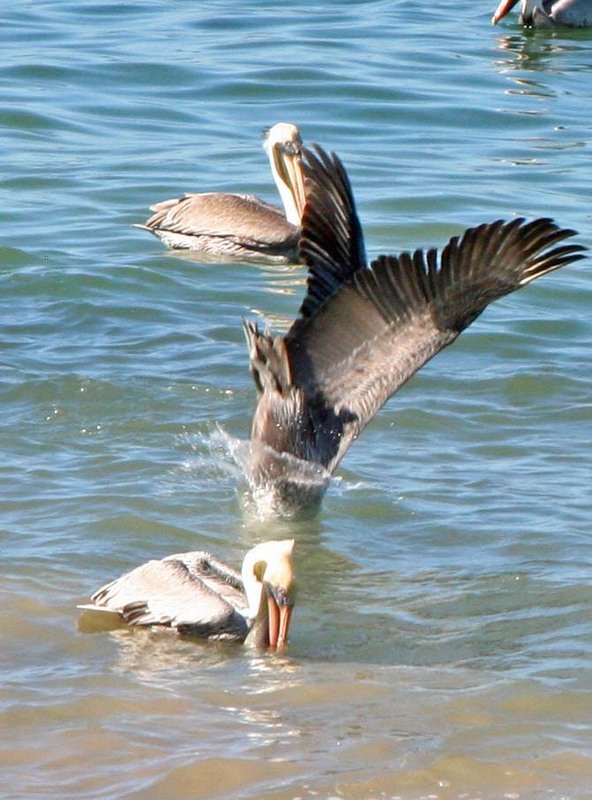 A Brown Pelican plunges toward the water. (Photo by Peggy Mekemson.) Note the pouch filled with water on the lower right. 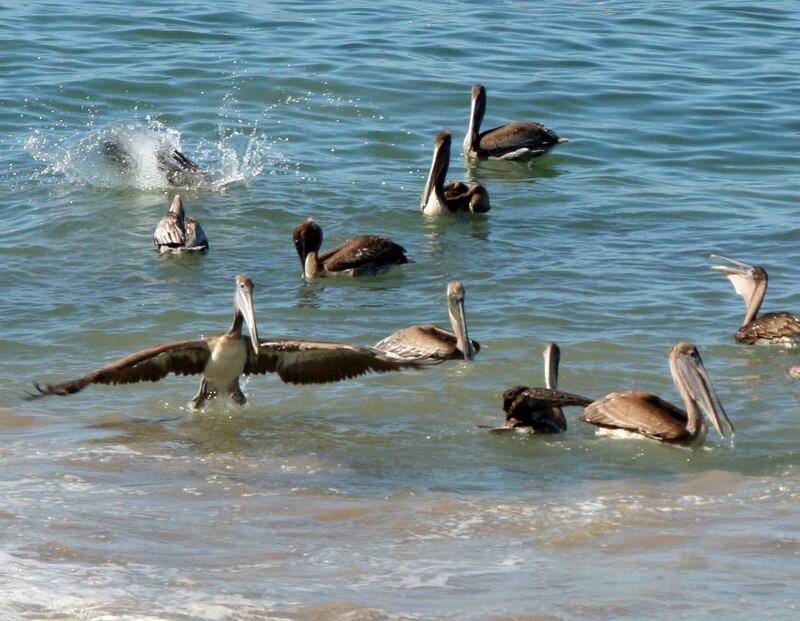 A small portion of the flock, some 17 pelicans, demonstrate various aspects of fishing. Hard to tell who is doing what, here. (Photo by Peggy Mekemson.) Liked the graceful tern on the left. 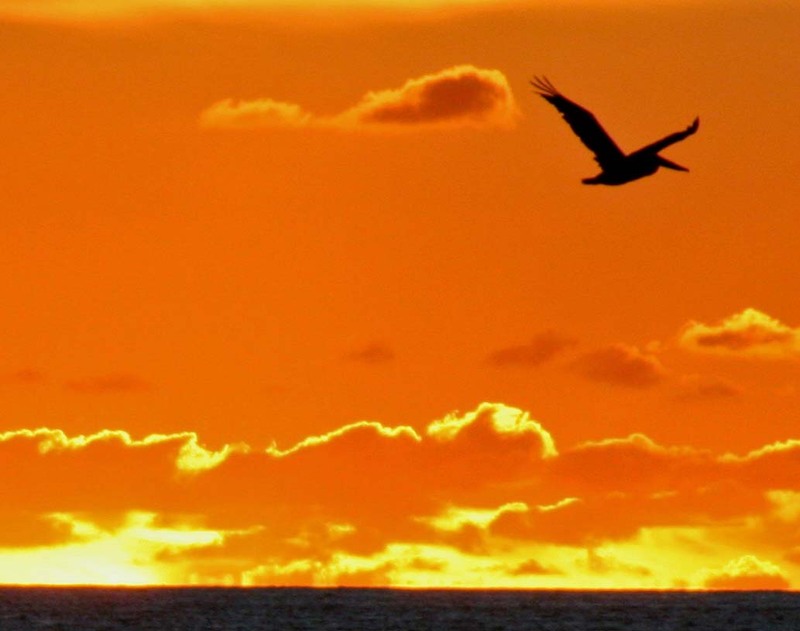 A pelican flies toward its nest at the end of the day. 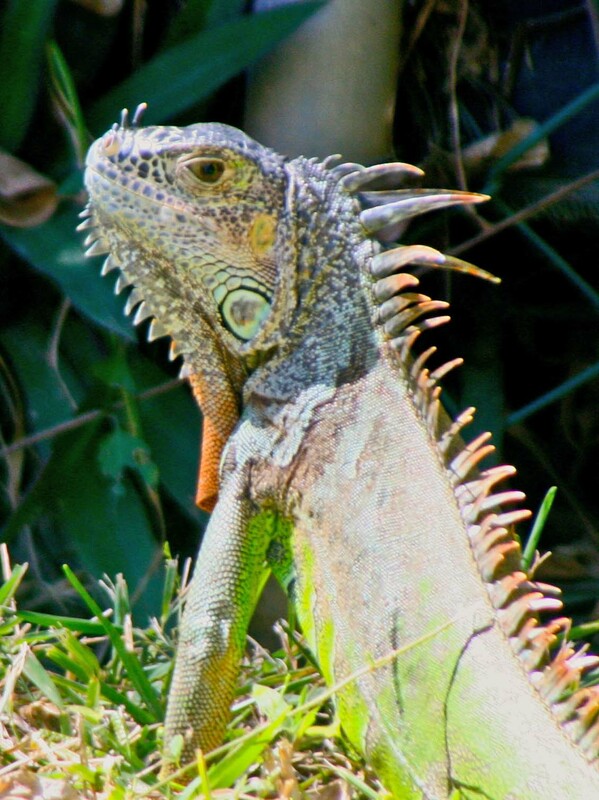 NEXT BLOG: Having featured the Brown Pelicans of Puerto Vallarta, I’ll move on to feature the Green Iguanas. 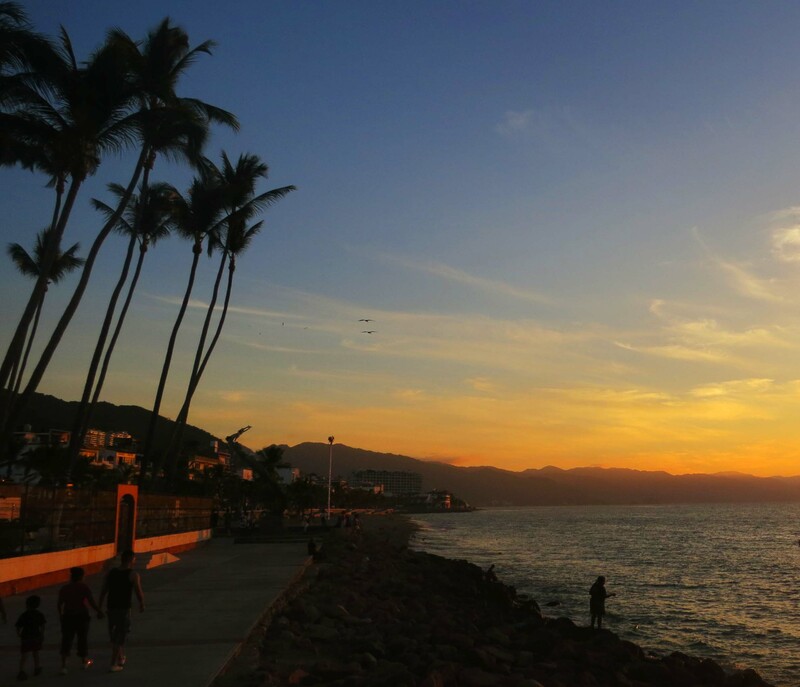 Beautiful sunsets are frequent in Puerto Vallarta. 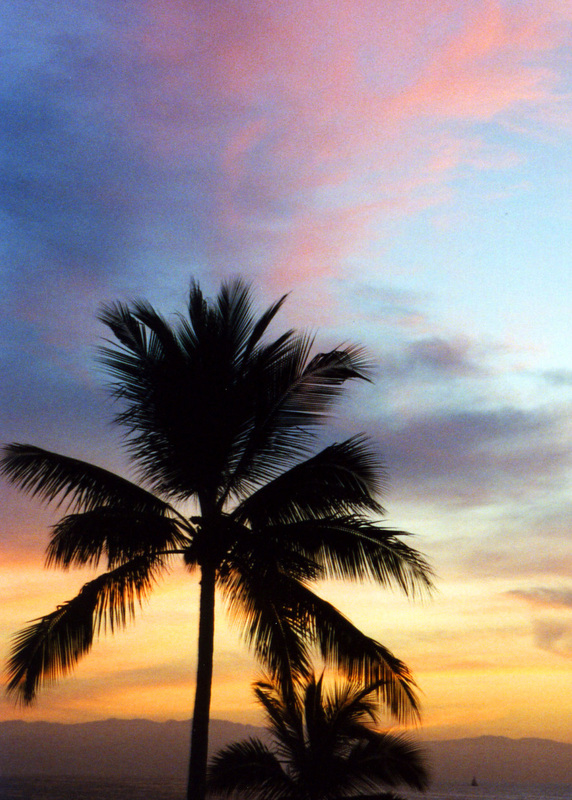 Throw in a palm tree and you have a post card type photo. This shot is looking south across the Bay of Bandaras toward the small village of Yalapa. OK, I’ve been bad. Six weeks of travel before Christmas brought my blogging to a halt. I resolve to be better during 2012. In fact, other than the often-promised, rarely-achieved resolution of beating my body into shape, it is my only New Year’s resolution. Puerto Vallarta is up first for 2012. With dire warnings of drug wars from friends and family, we spent two of our six weeks of pre-Christmas travel there. All we saw related to the wars were young soldiers armed with automatic weapons wandering through the hotel property. It was enough. Our three-year-old grandson Cody loaded his imaginary machine gun and fired off rounds at them. It dismayed his mother and amused us. Peggy loves Puerto Vallarta. I like it much better since the ubiquitous and obnoxious time-share salesmen have, at least temporarily, disappeared from the streets. If you want a perspective, imagine ten used car salesmen per block, each dedicated to selling you an over priced used car you are expected to share with 50 other families. The town has been a major attraction for Americans ever since Richard Burton and Elizabeth Tailor filmed Night of the Iguana there in 1963. Taylor’s extramarital affaire with Burton guaranteed massive media coverage and the beginning of the tourist trek southward. 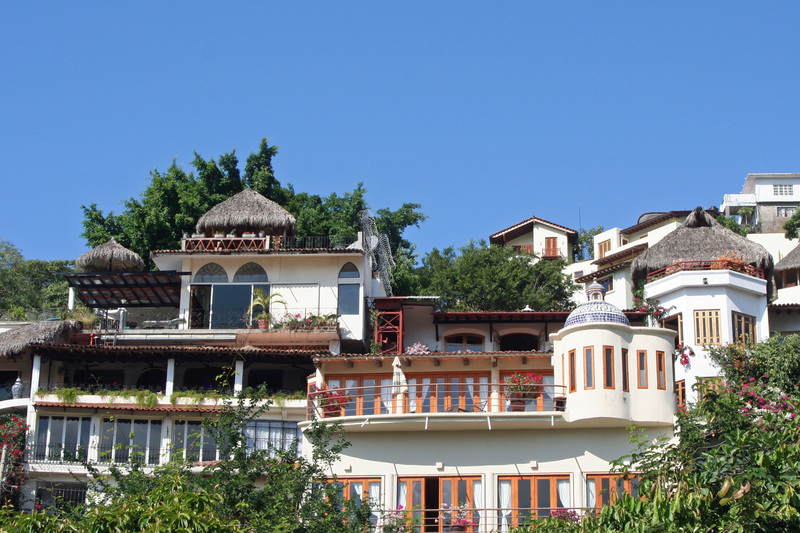 Puerto Vallarta makes its living off tourists. This becomes particularly obvious on days when the massive cruise ships are in town. Still, the city has its charm. I am particularly fond of the Isla Rio Cuale and the Malecon, a downtown walkway that fronts on the ocean and is filled with sculptures. Sunsets on the Bay of Bandaras are also worthy of mention. 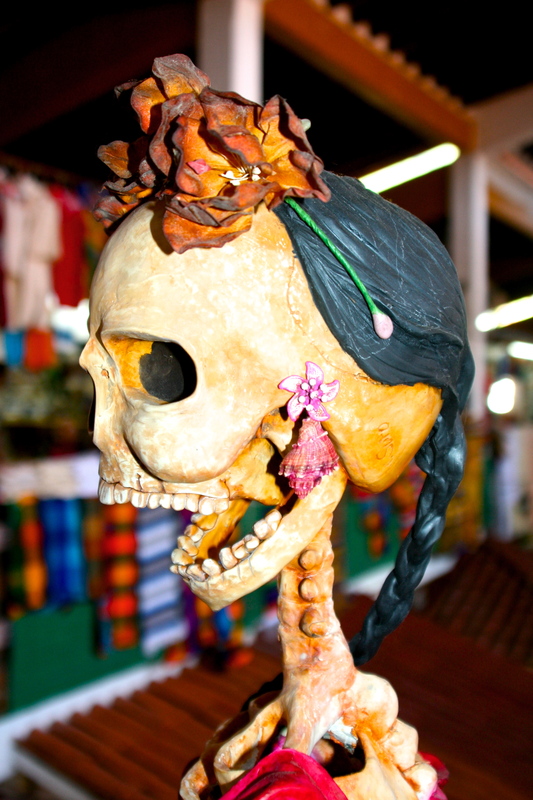 Shopping can be fun; a number of fine crafted items are for sale plus there are the usual Mexican crafts. The latter are found in abundance at the port and the downtown Market. Bargaining is expected. Prices are increased to account for the practice. Tourists feel they have driven a hard bargain and shop owners walk away with a profit. Taking a river taxi to small village of Yalapa south of Puerto Vallarta provides both diversion and a small adventure. 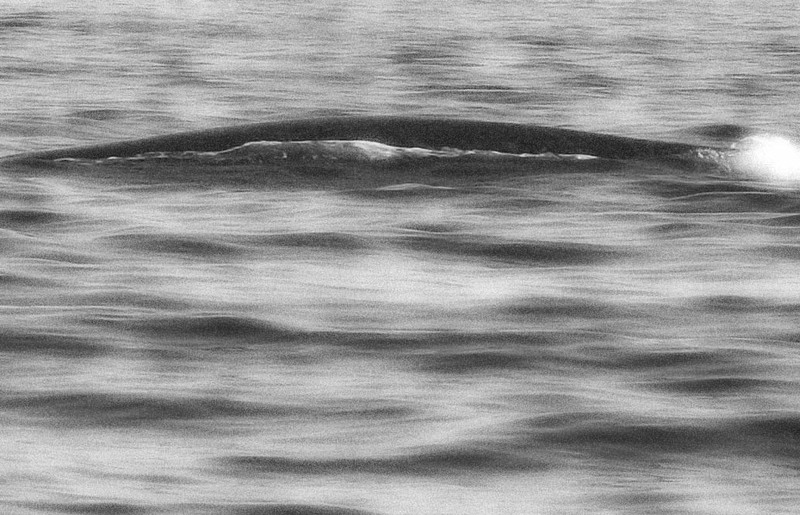 We saw blue whales and dolphins on our way there this year. 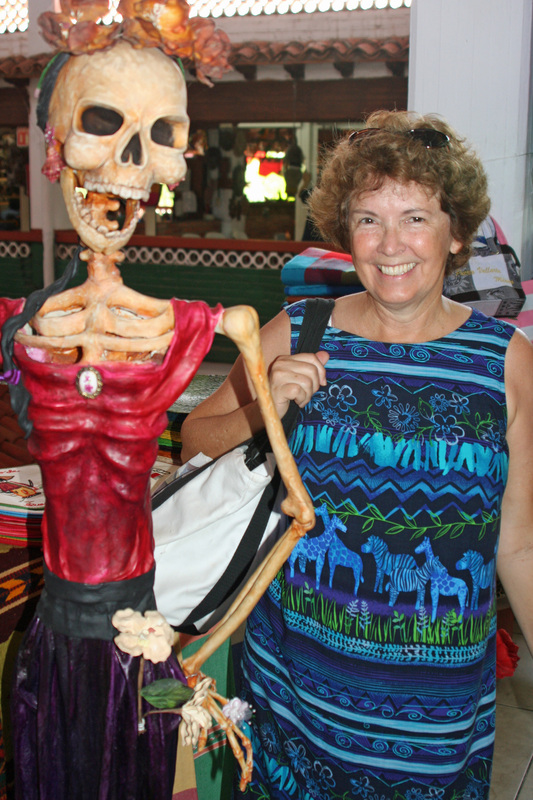 Peggy and I visit Puerto Vallarta every other year for one to two weeks. 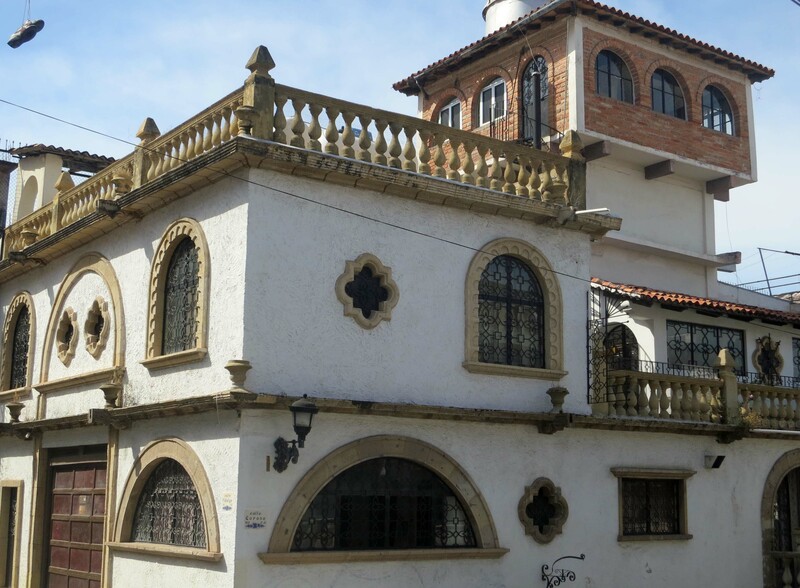 The following photos hopefully capture what we like about the city and its environs. 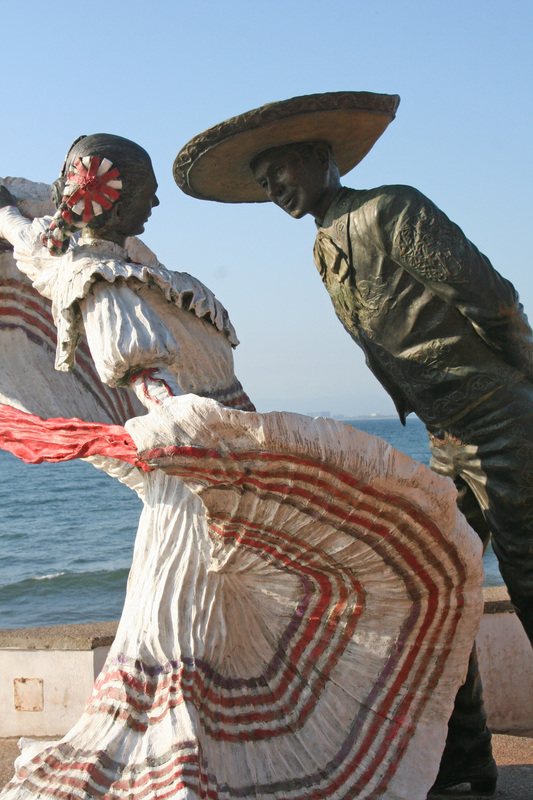 Puerto Vallarta has done an excellent job of placing sculptures along the Malecon, an attractive car-free walk-way that fronts the Bay of Bandaras downtown. 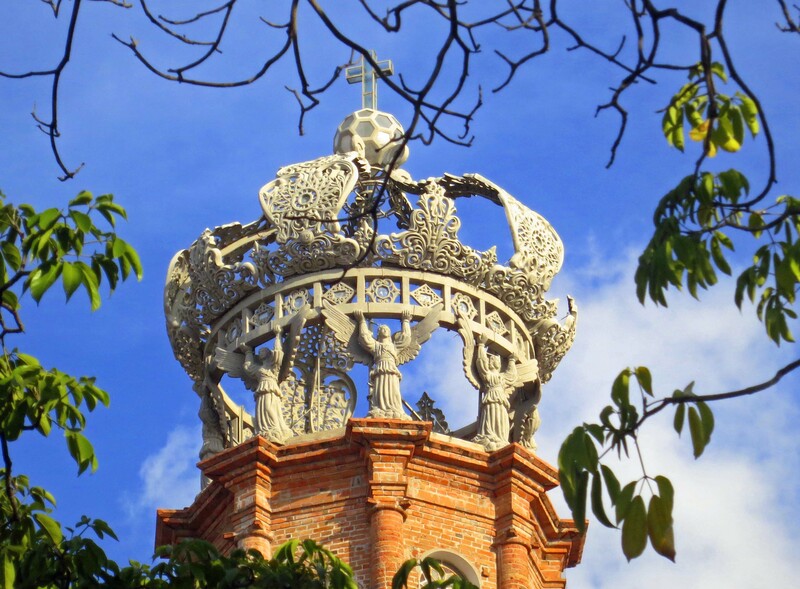 Another attractive downtown Puerto Vallarta site is Our Lady of Guadalupe Church of and its unique tower. 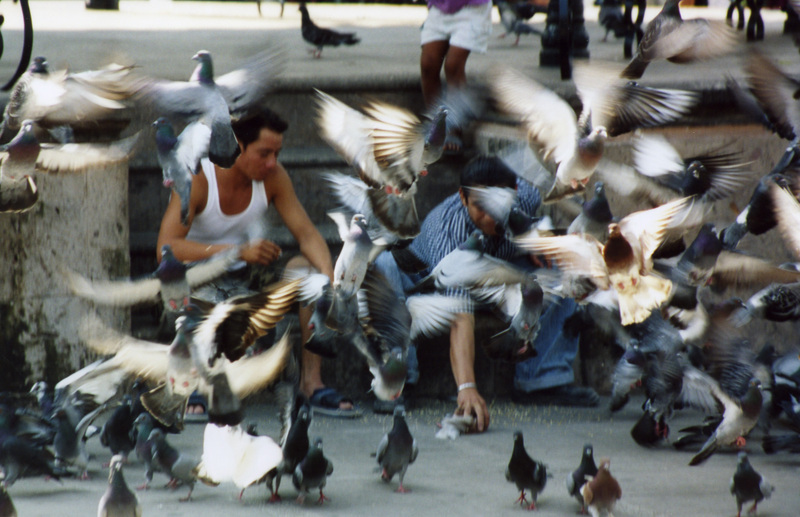 I shot this photo of pigeons in flight at a small town square. 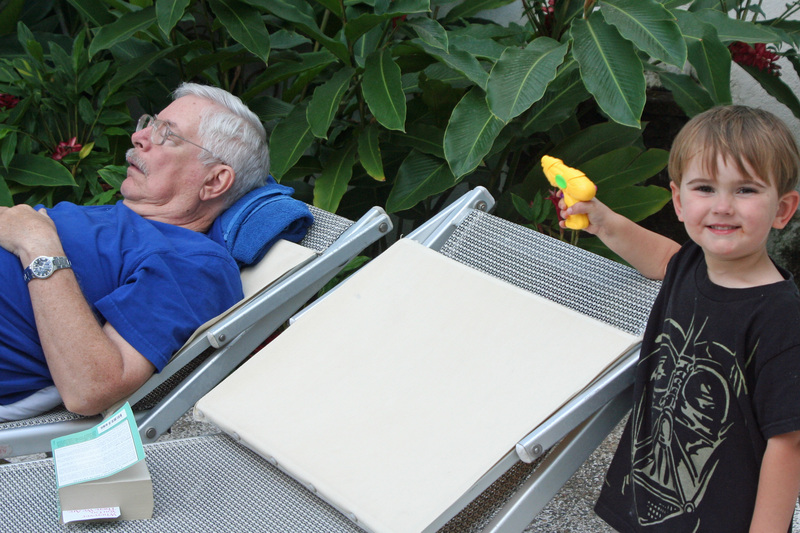 The young Cody who fired his imaginary machine gun at the Mexican soldiers prepares to fire a very real water gun at me as I am catching a nap. Both his mother and grandmother were encouraging this reprehensible behavior. 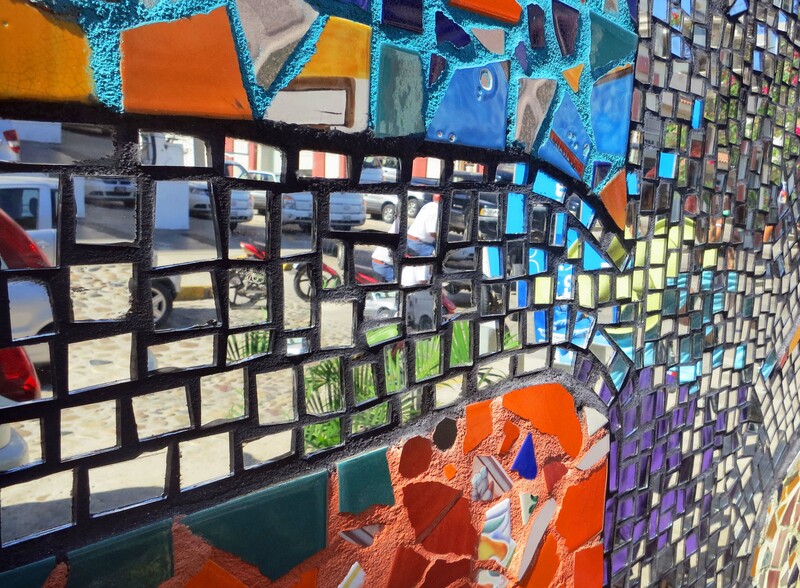 Quaint streets and walkways make a walking tour of Gringo Gulch a must. This is where Elizabeth Taylor and Richard Burton lived when they were filming the Night Of the Iguana and had their notorious affaire. Peggy and I were at a restaurant called Tapas in Gringo Gulch with our friends Tom and Beth Lovering when we found this great parody of the Marilyn Monroe photo. I was particularly taken with it because it resembled one of the holiday cards I design and draw for friends and family each year. It's featured below. I am sure you will spot the resemblance. What can I say? Happy New Year? 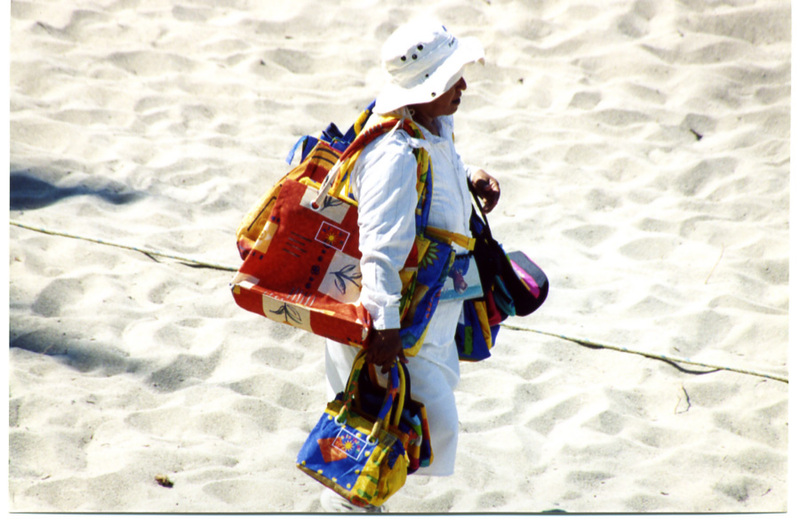 There are lots of great beaches in Puerto Vallarta but be prepared to be visited by a steady stream of vendors. They come with the territory. The Public Market next to the Rio Cuale is filled (brimming over) with small shops featuring Mexican Crafts and inexpensive local restaurants. We also found this attractive lady skeleton that Peggy is matching smiles with. 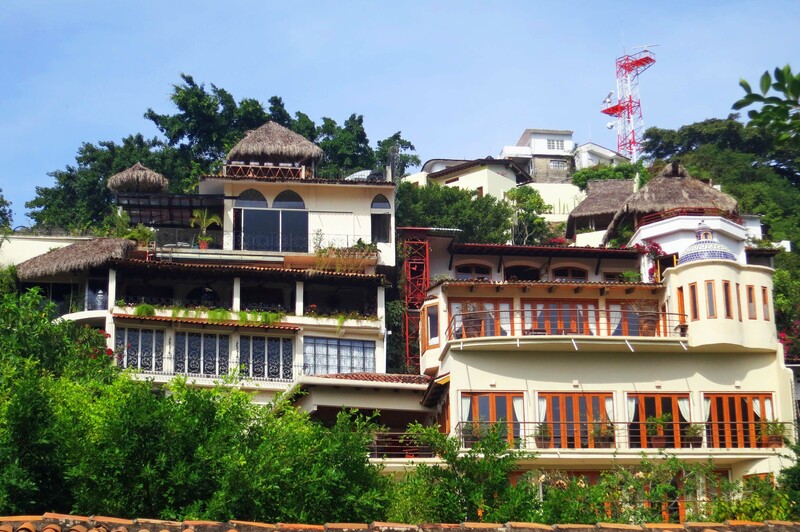 Restaurants, a museum, crafts and arts are featured on the island located in the middle of the Rio Cuale. 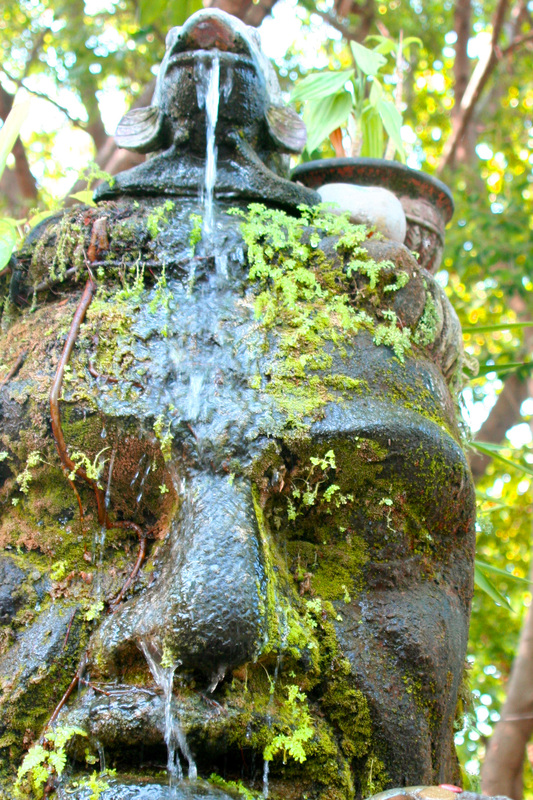 We also found this intriguing sculpture/fountain. 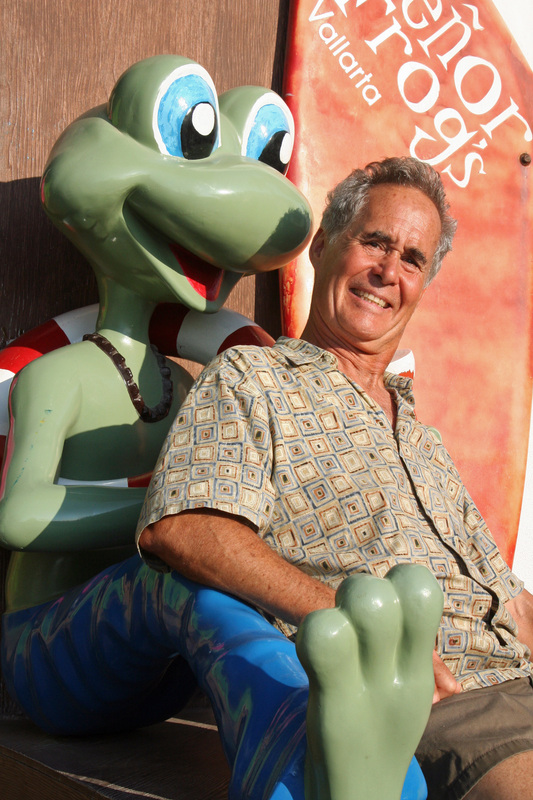 My friend Tom Lovering can't imagine why anyone would go to Sr. Frogs with so many good local restaurants in Puerto Vallarta but I managed to get him to pose with the frog. 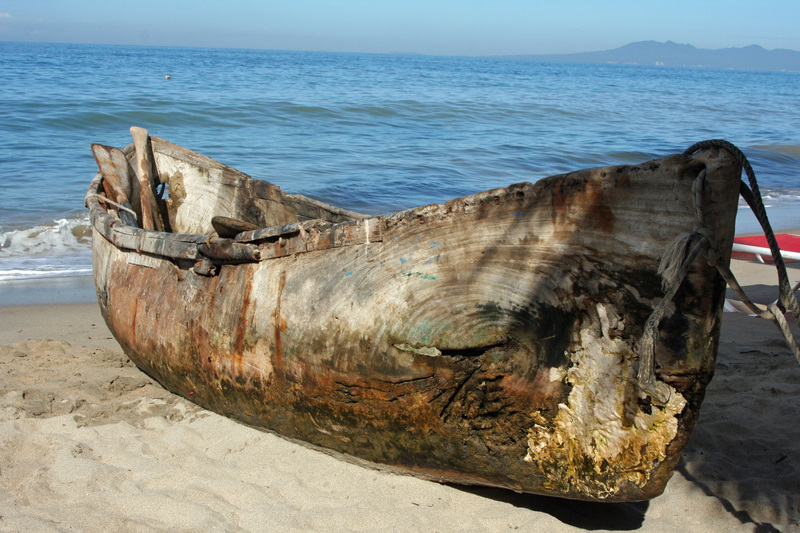 Peggy took this photo of a rather attractive wood canoe on the beach. Note how it has been carved from one log. I took this photo of Mexican crafts at the small village of Yalapa which is south of Puerto Vallarta and can only be reached by water. 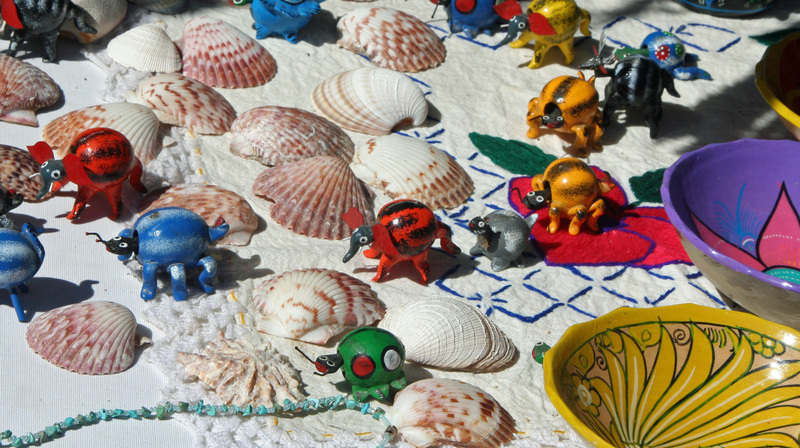 I love the bright colors and can't resist the small boggle-head creatures, in this case, turtles.